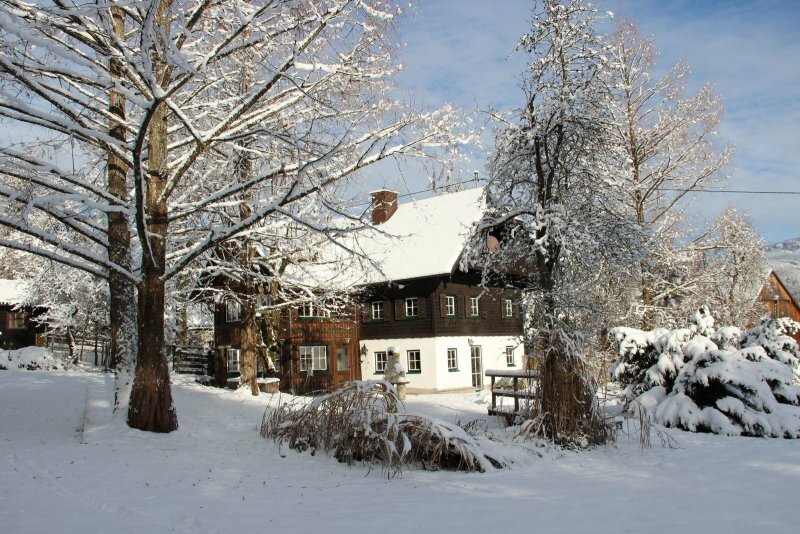 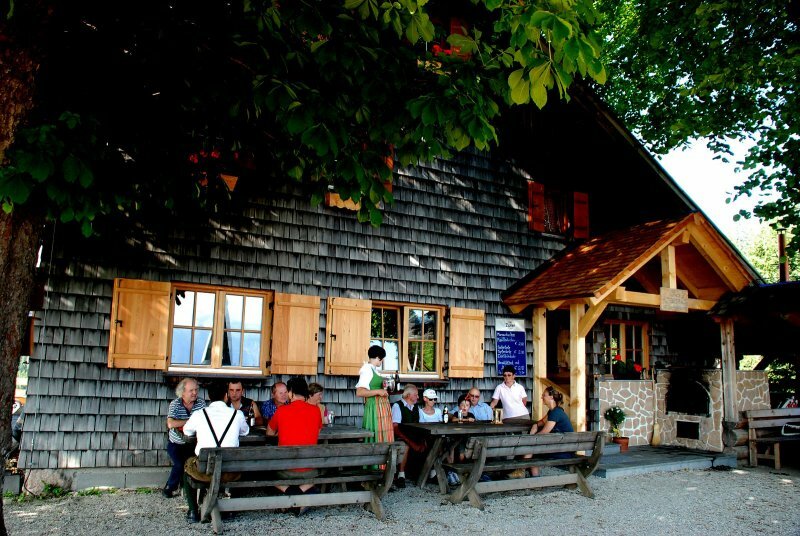 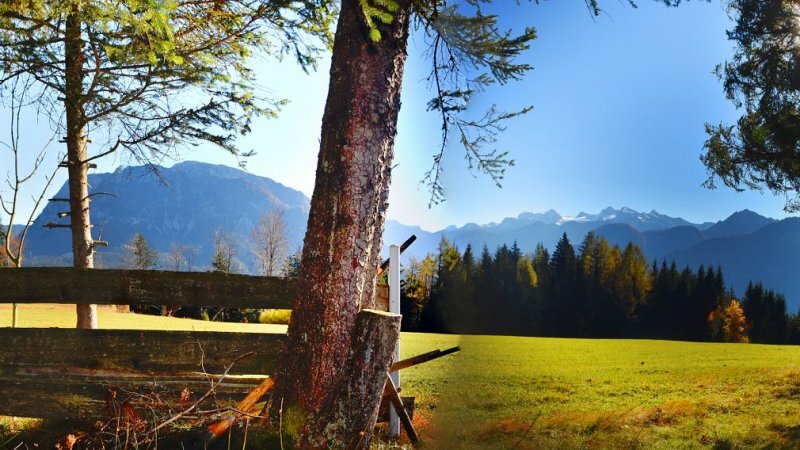 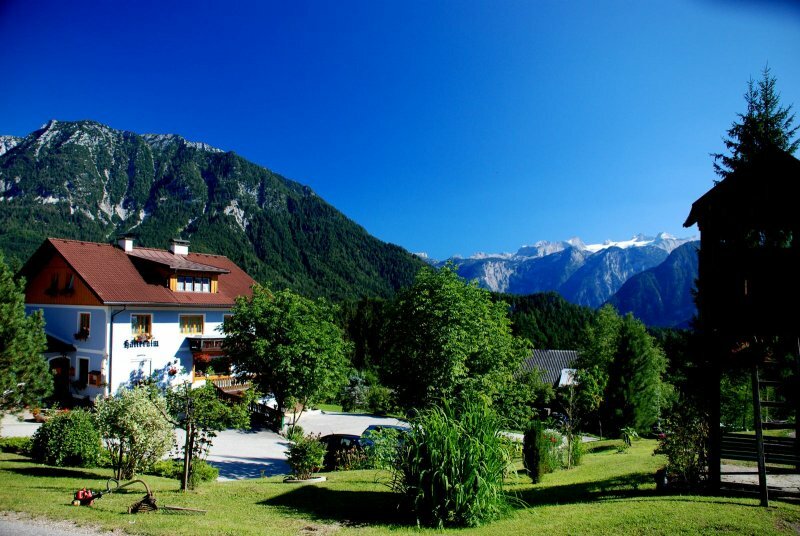 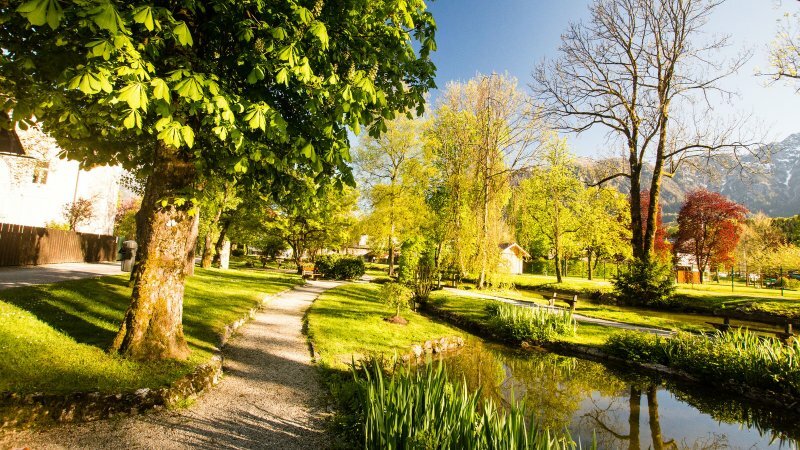 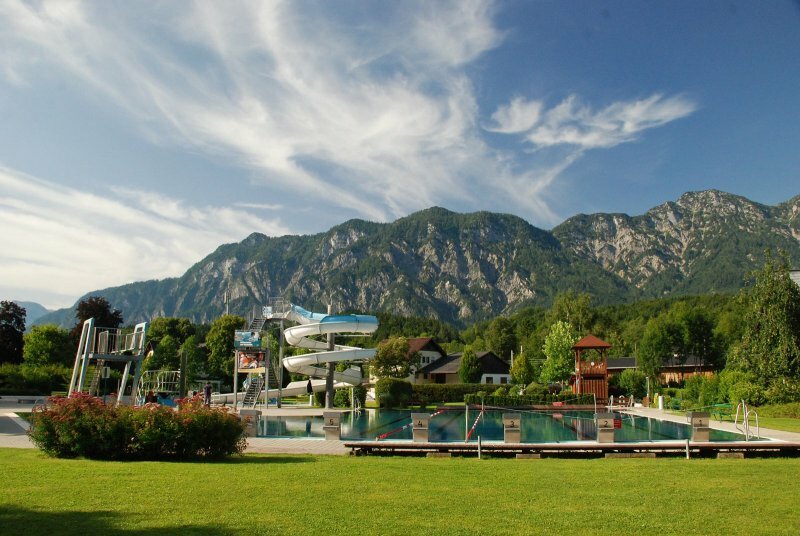 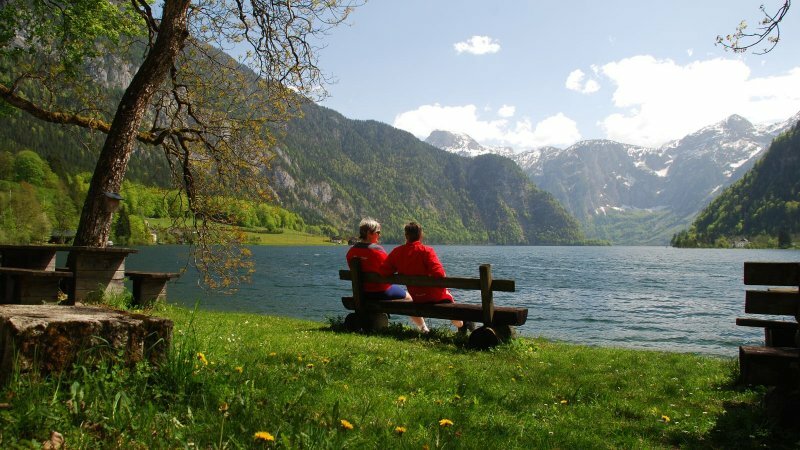 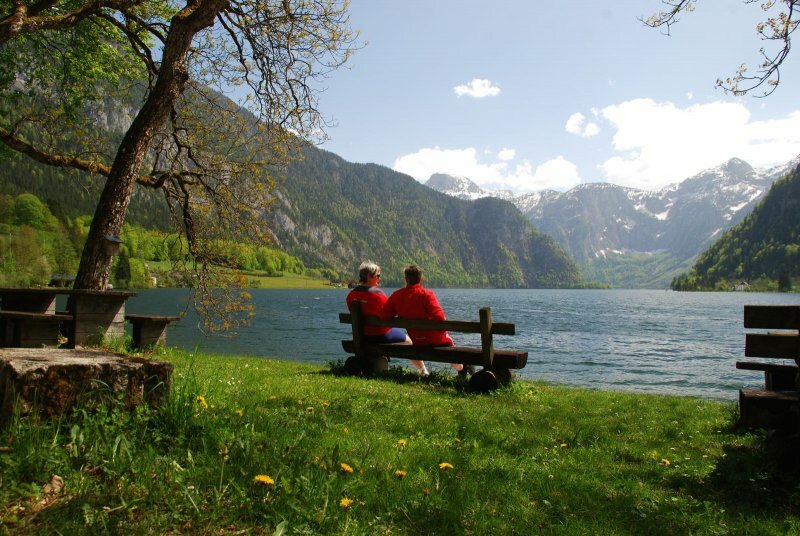 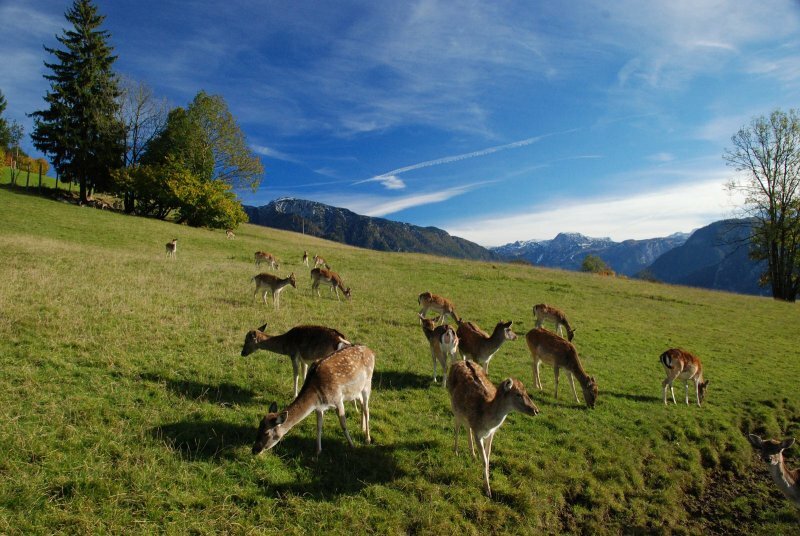 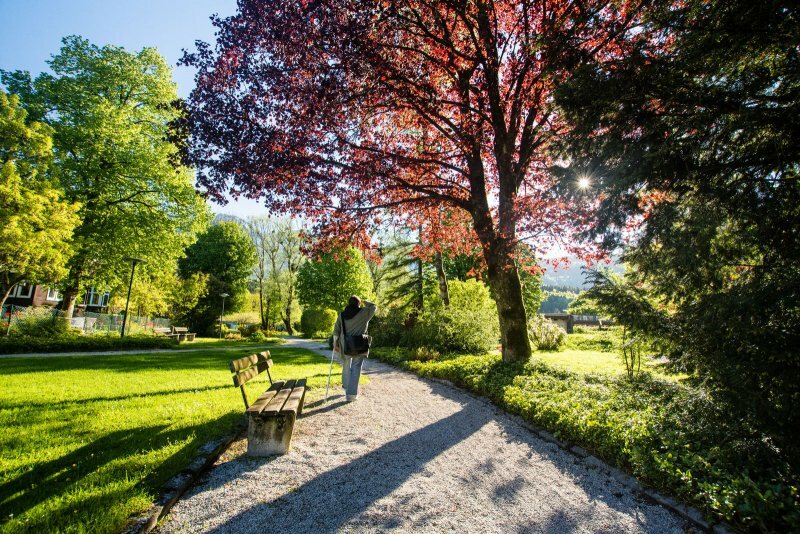 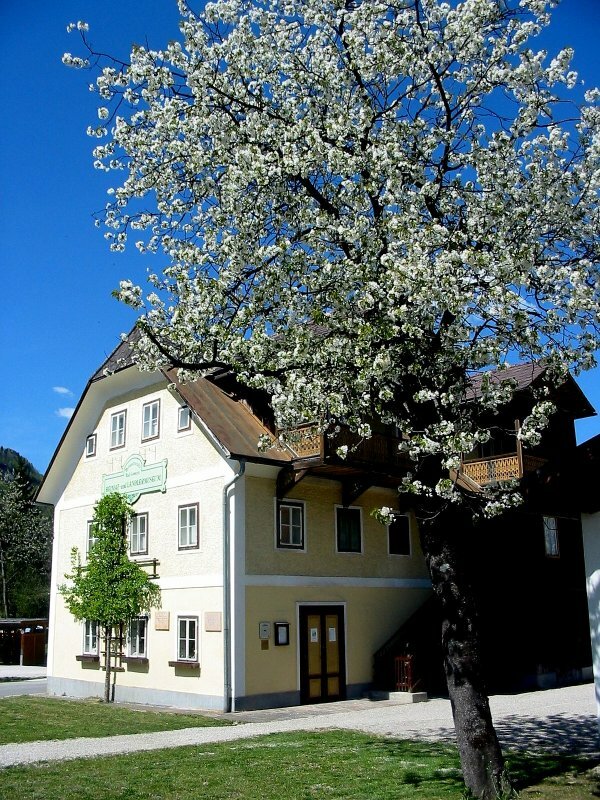 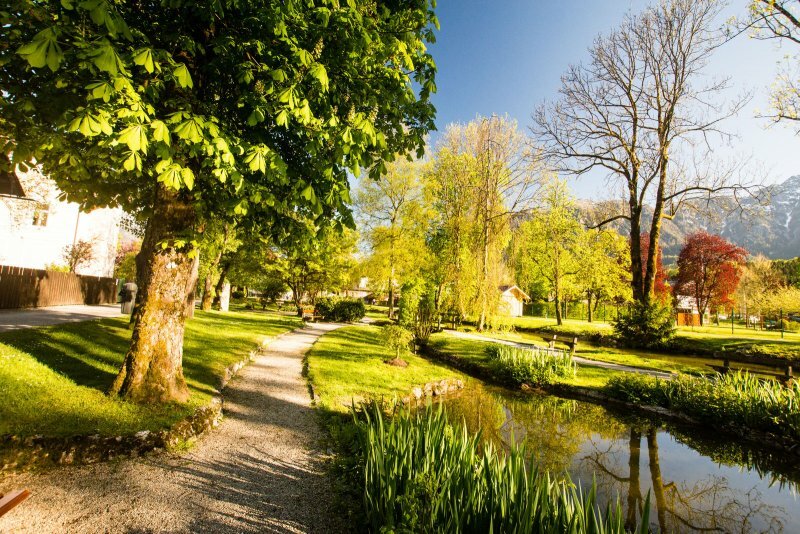 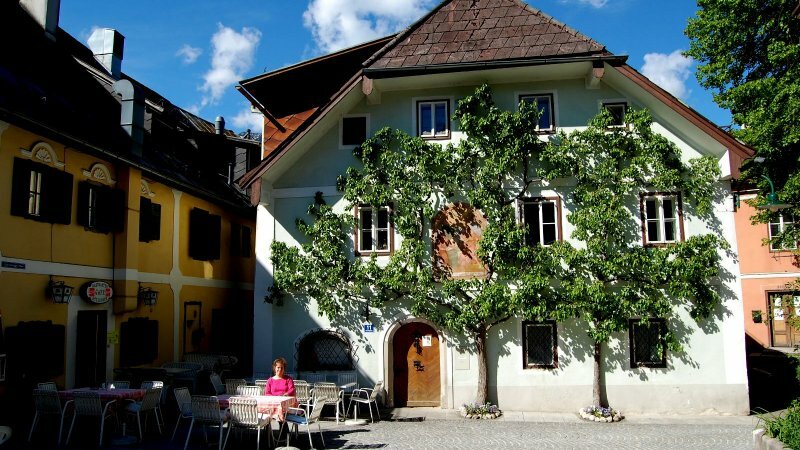 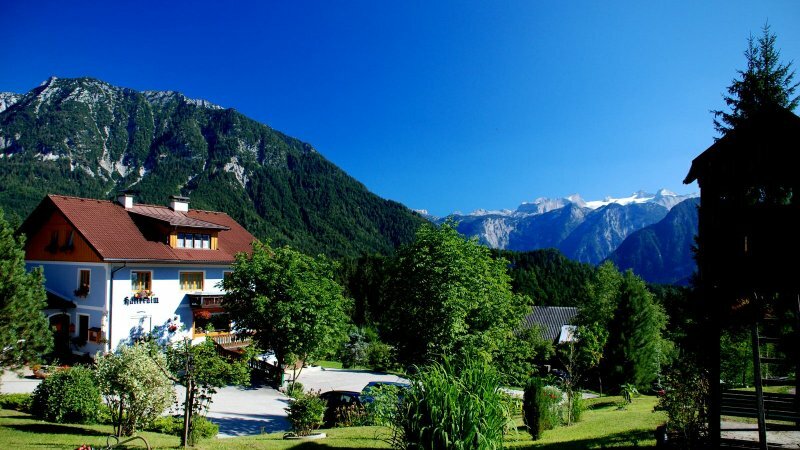 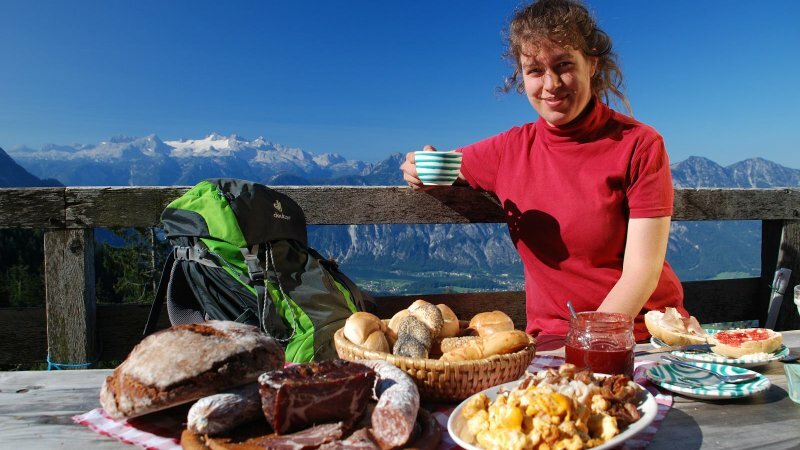 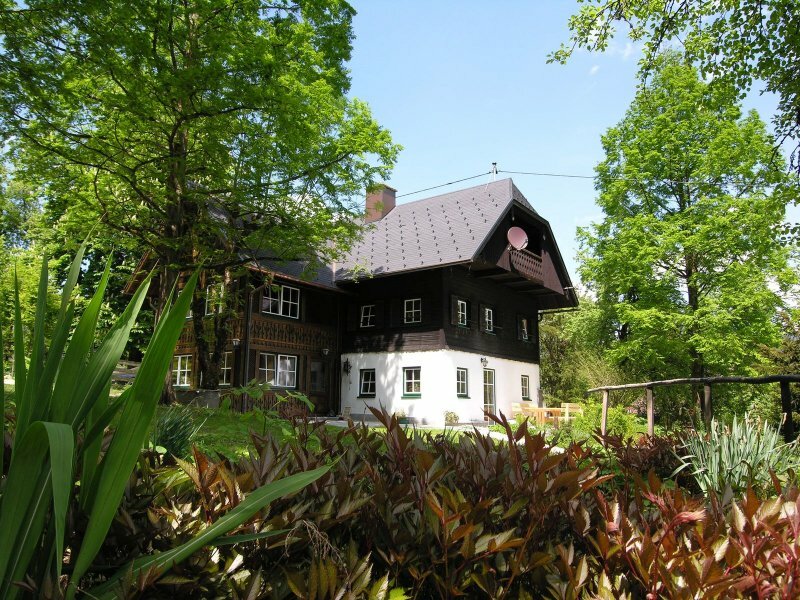 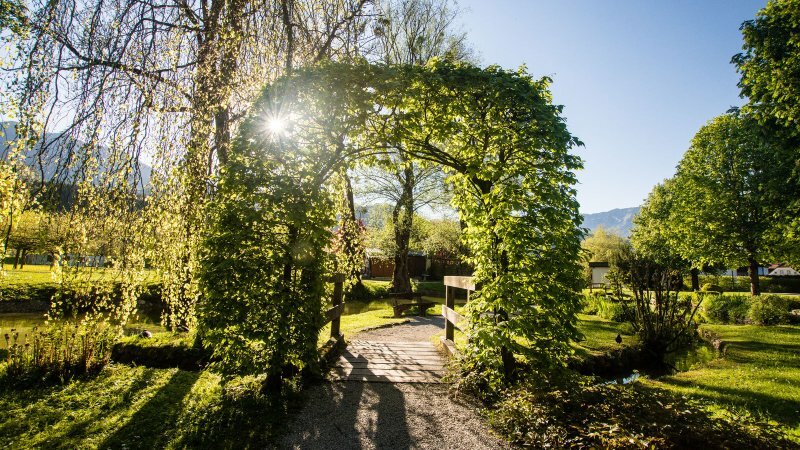 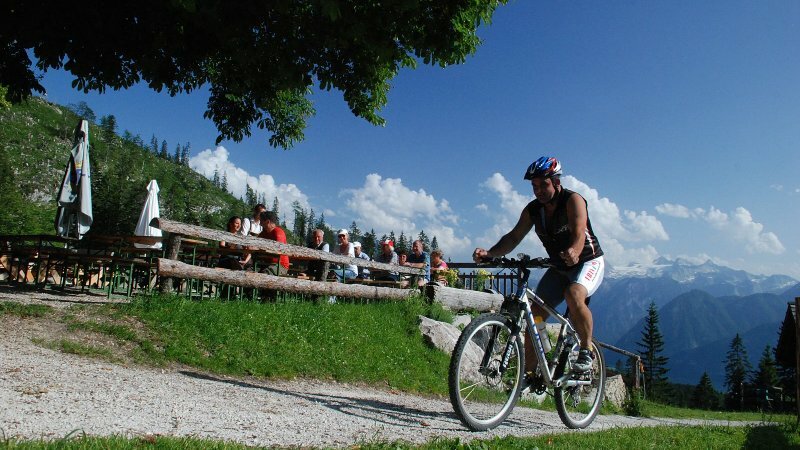 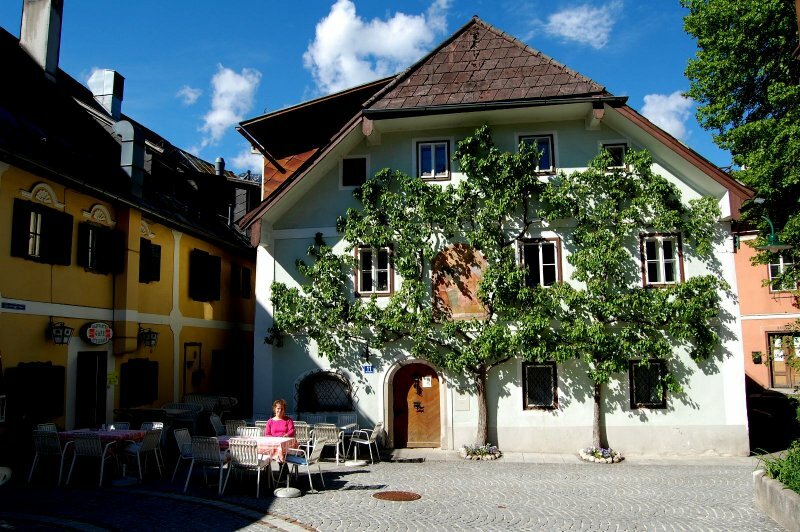 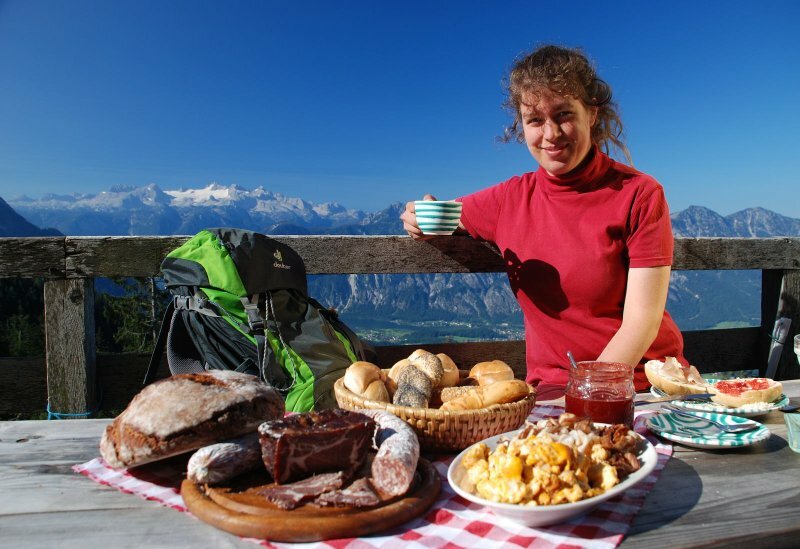 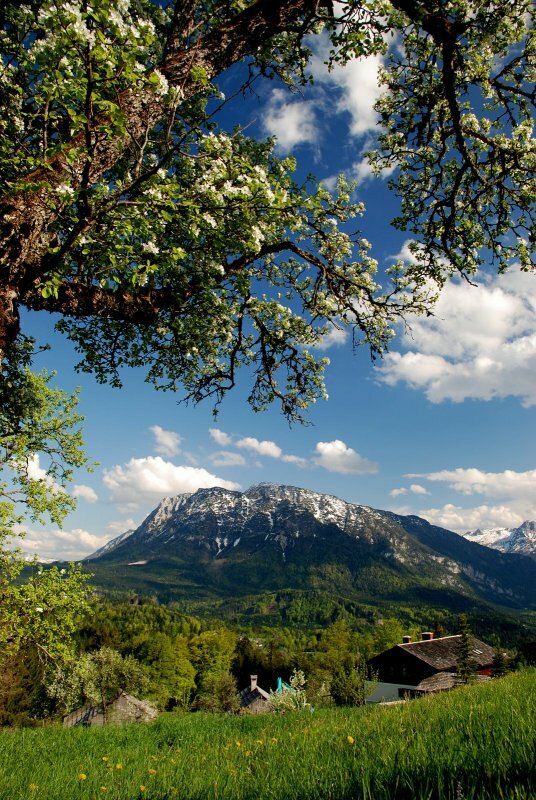 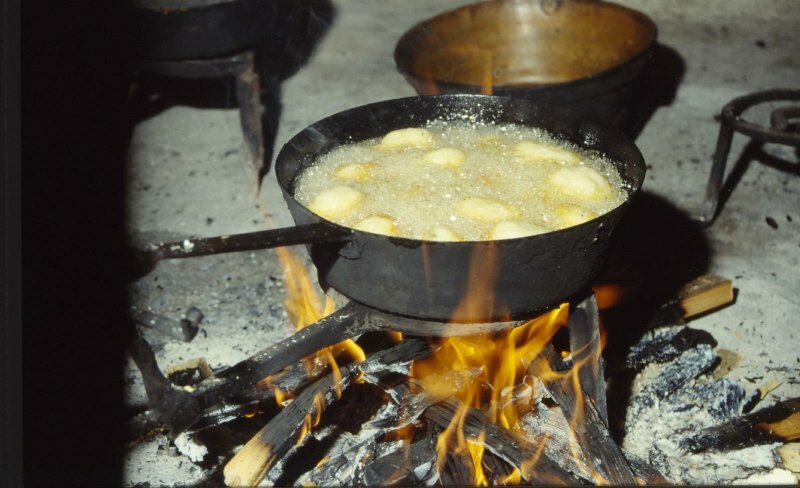 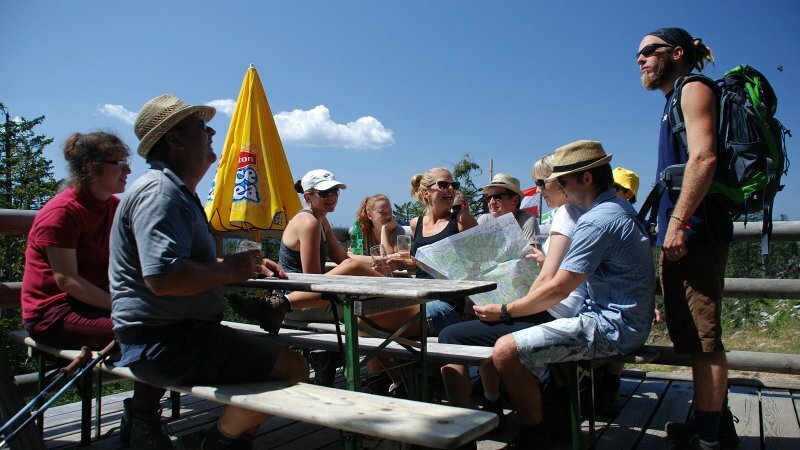 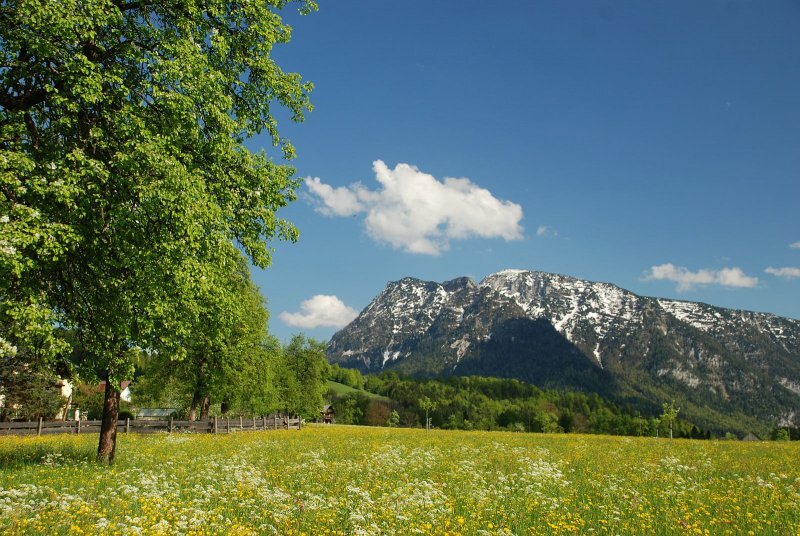 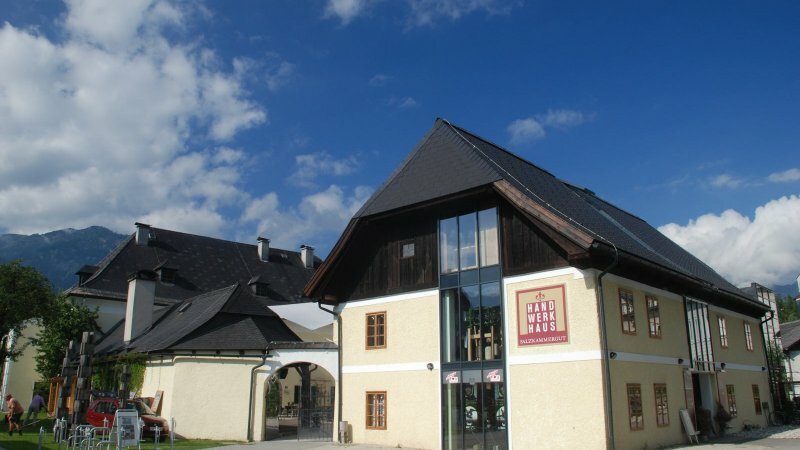 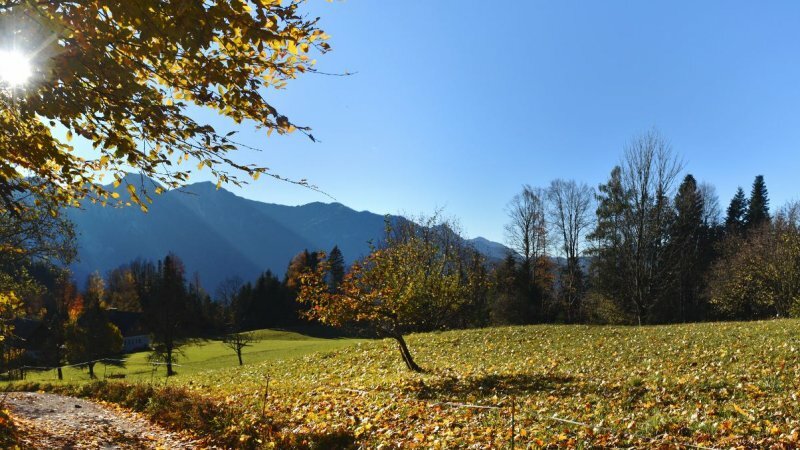 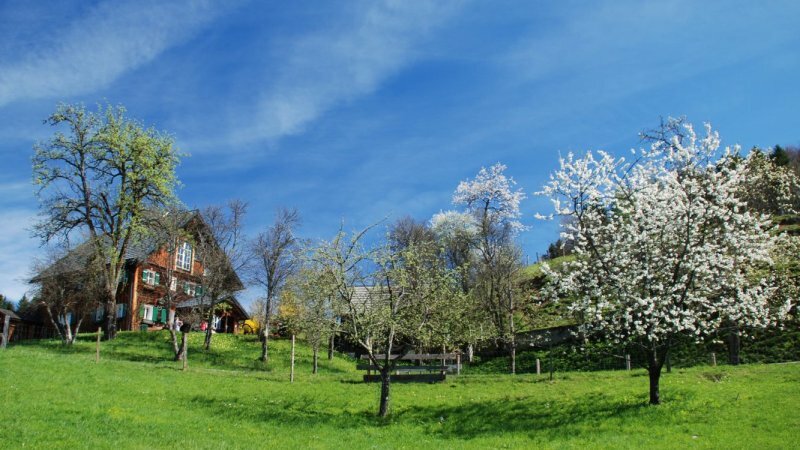 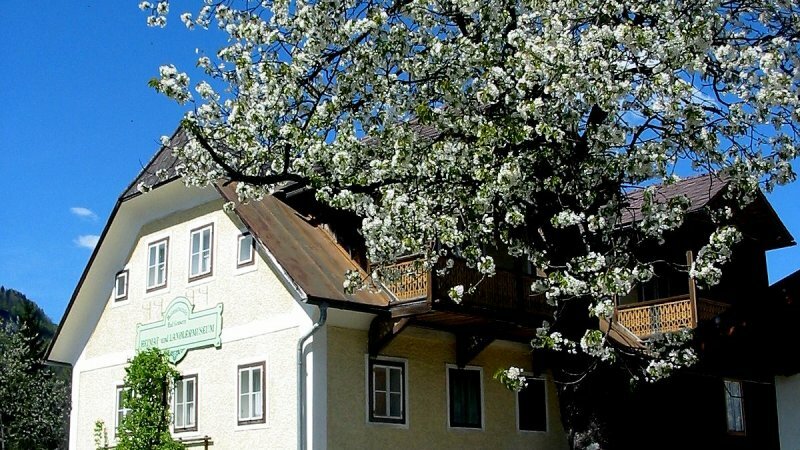 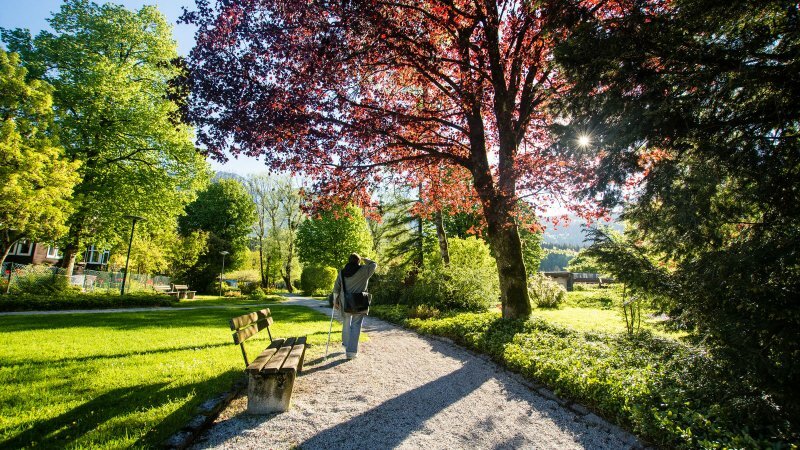 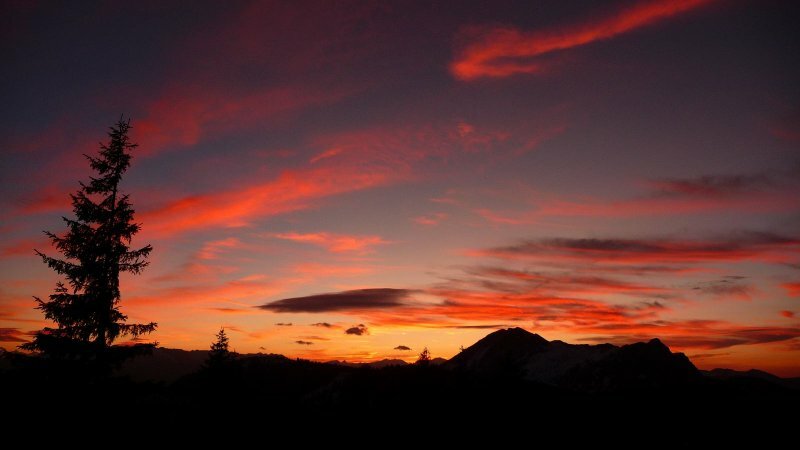 Home Hotels & more Holiday homes Bad Goisern Holiday home "Gut Eisenlehen"
The holiday home is located about 5 kilometers from the centre in a quiet residential area. 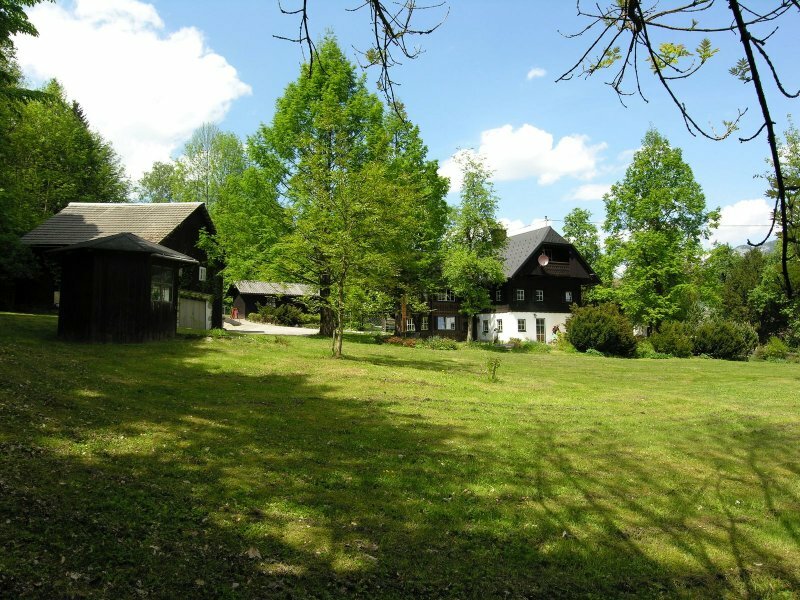 Both the large garden and the beautiful large sun terrace offer magnificent views of the directly adjacent meadows and forests and mountains behind. 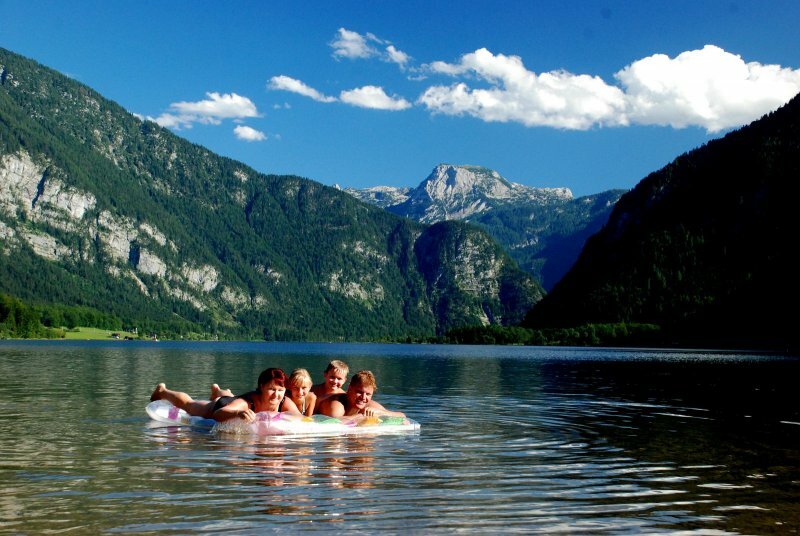 Holiday in Austria: Impressions from the "Gut Eisenlehen" holiday home in bad Goisern on Lake Hallstatt in the UNESCO World Heritage region of Hallstatt Dachstein Salzkammergut. 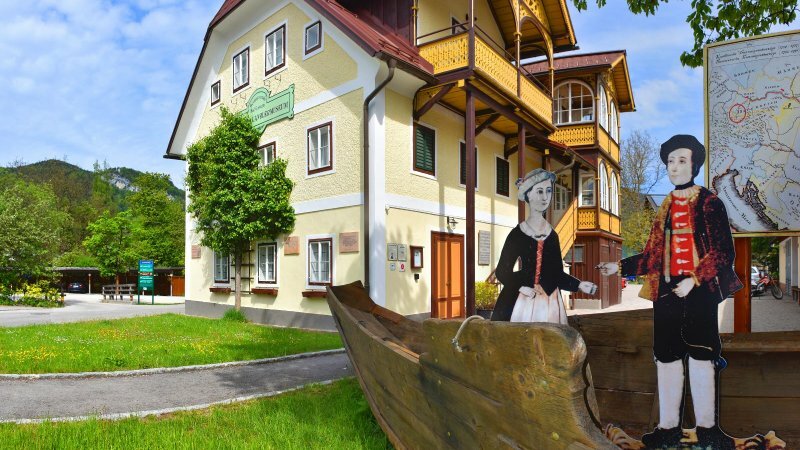 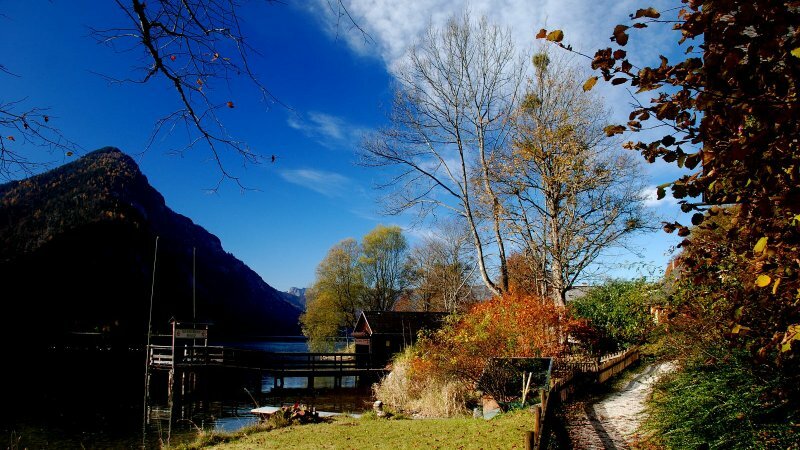 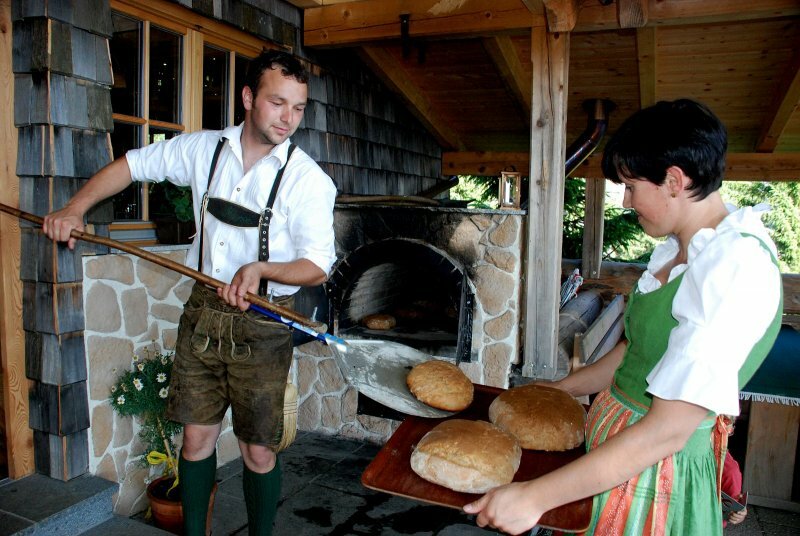 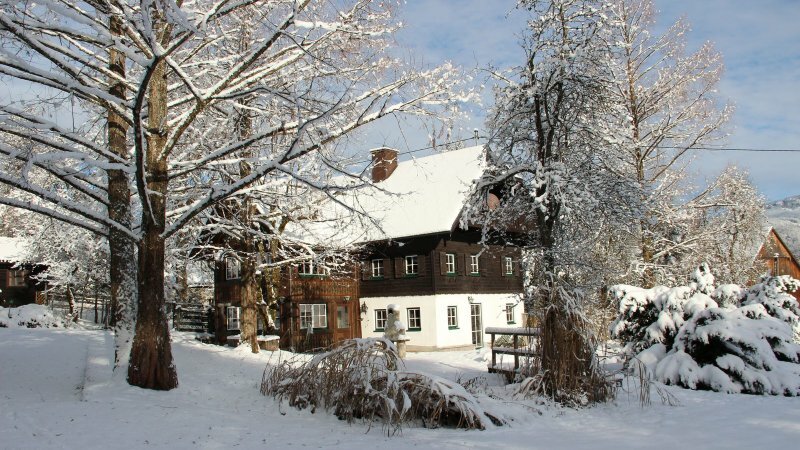 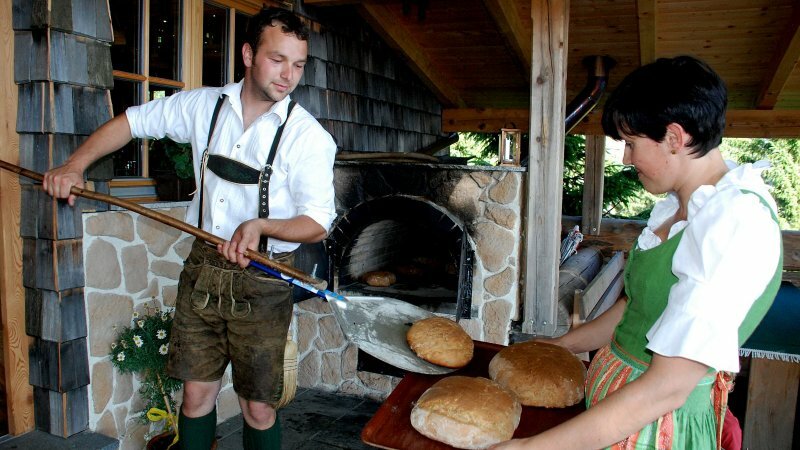 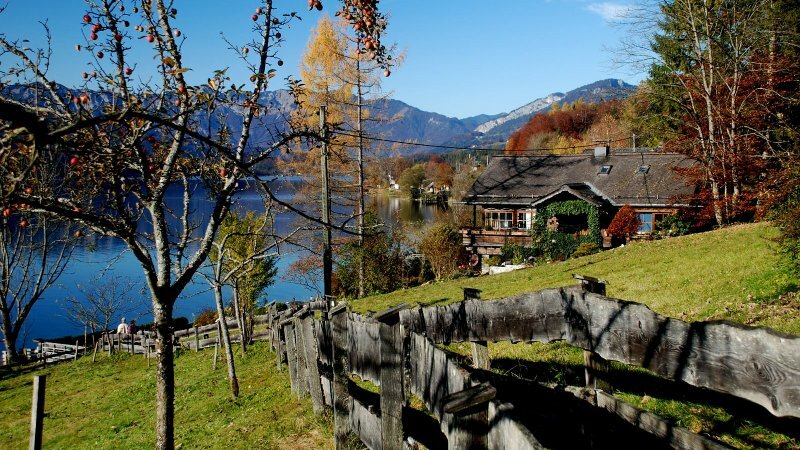 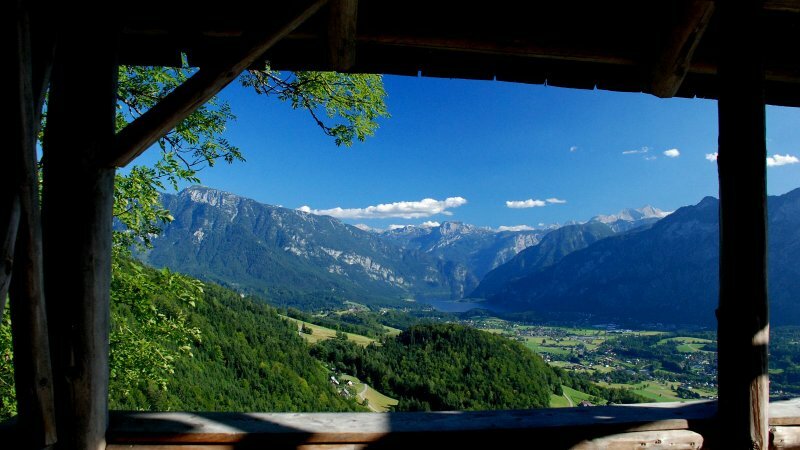 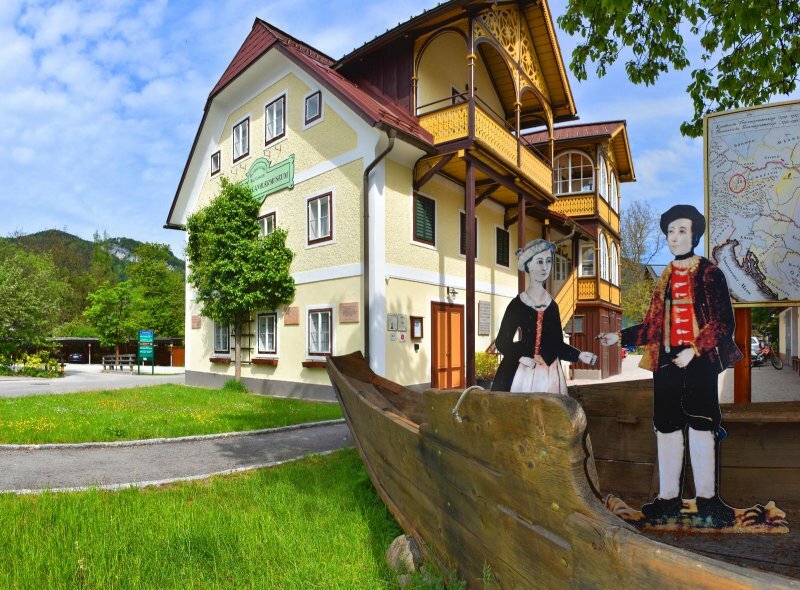 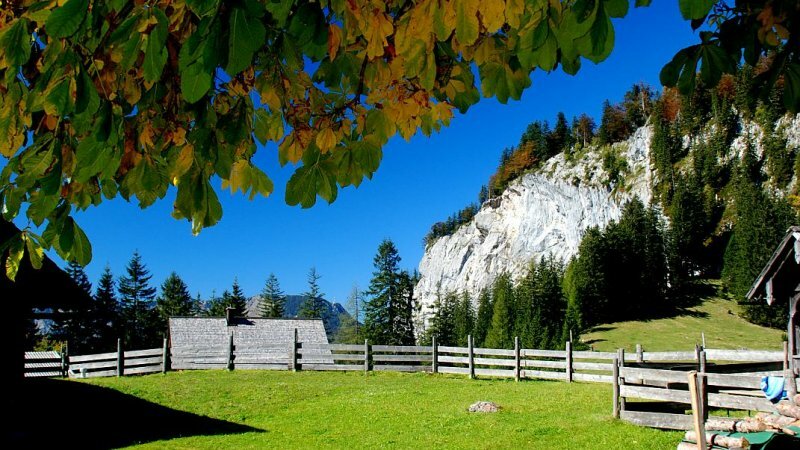 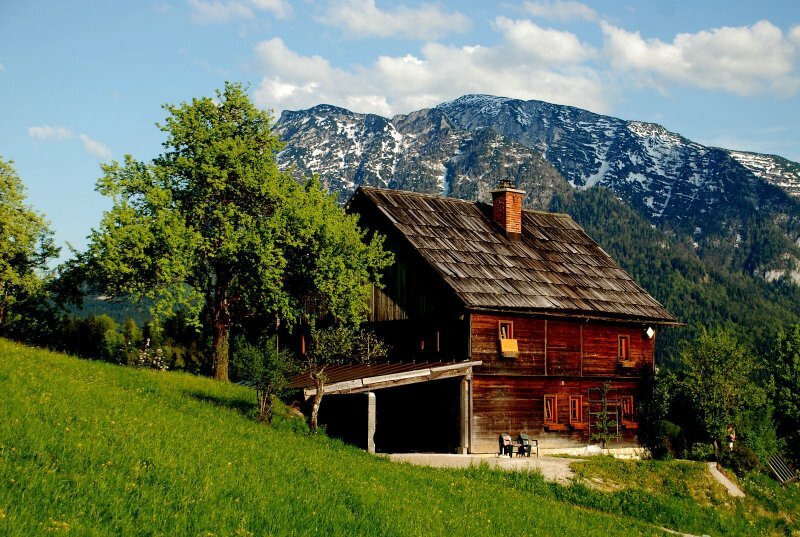 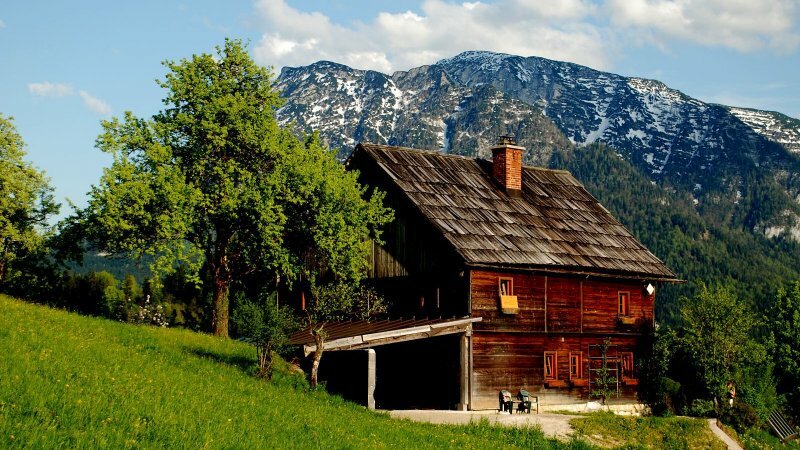 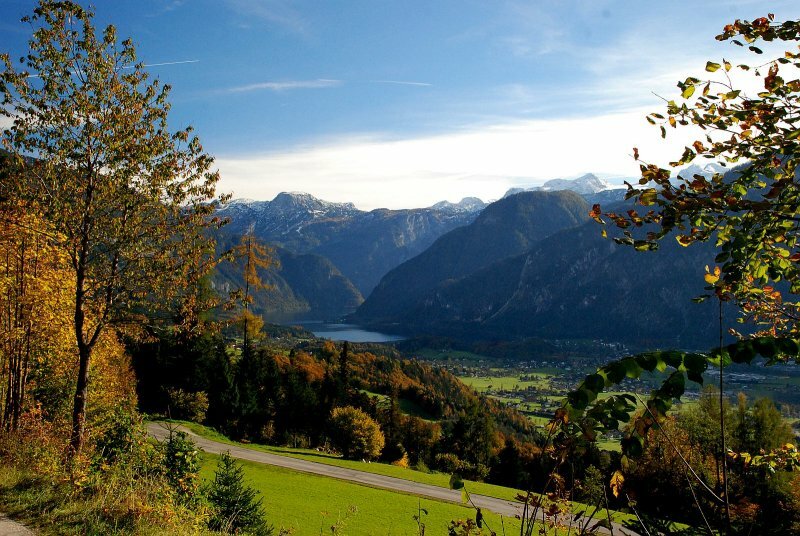 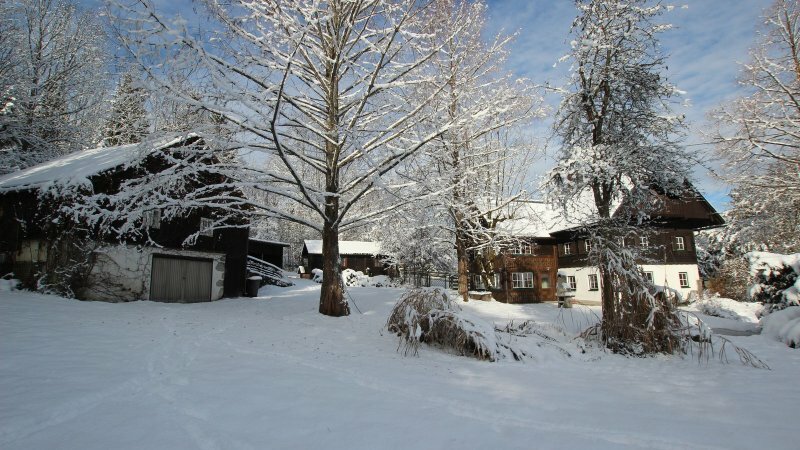 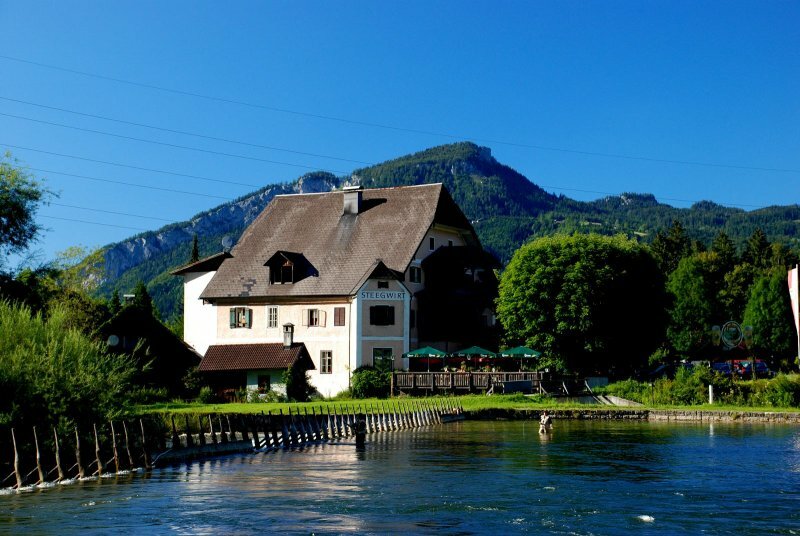 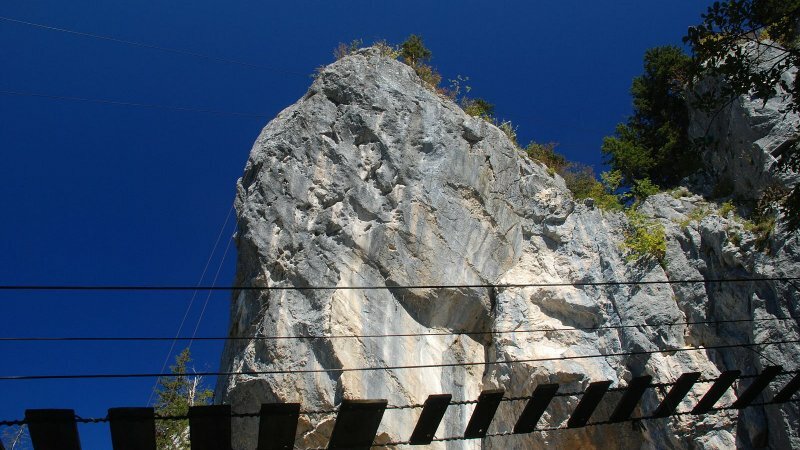 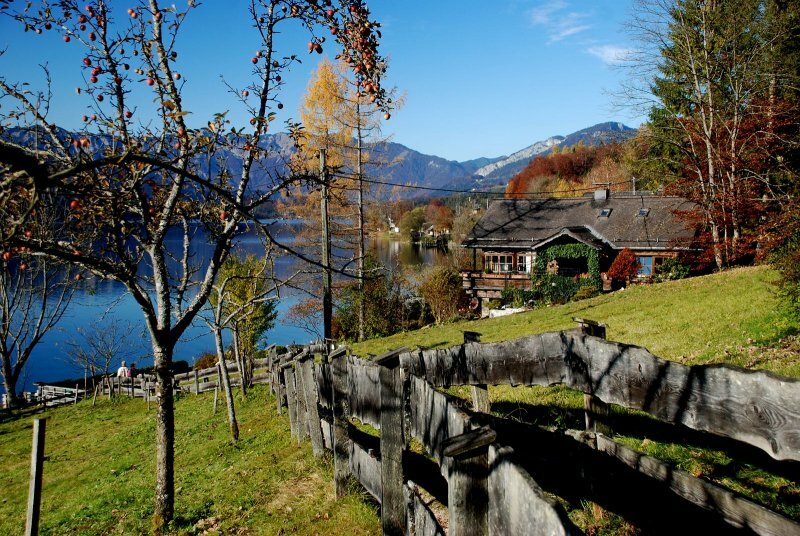 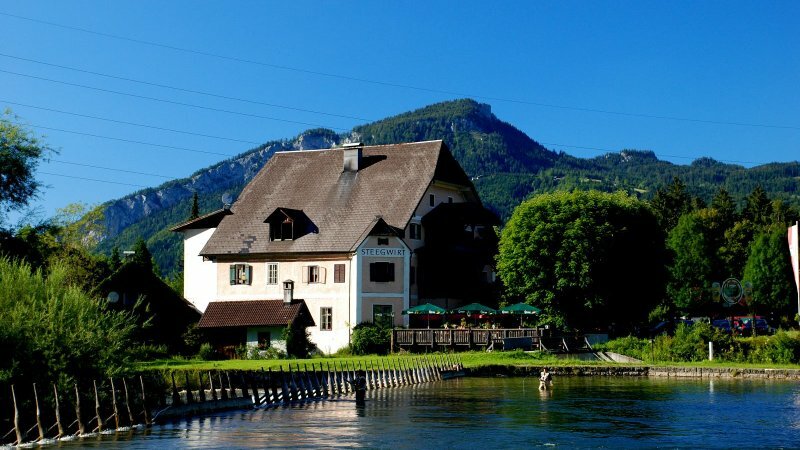 The "Gut Eisenlehen" holiday home is located about 5 kilometers from the centre of Bad Goisern on Lake Hallstatt, in a quiet residential area at the foot of the Ramsau mountain range. 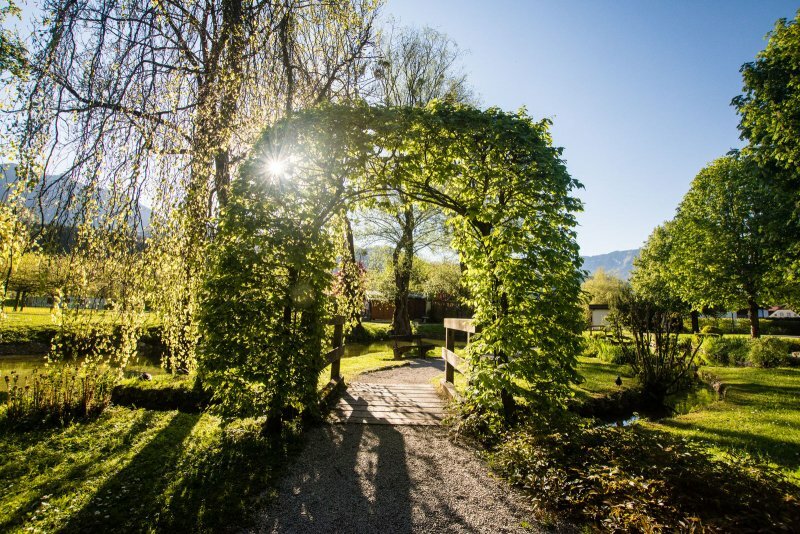 Both the large garden and the beautiful large sun terrace offer magnificent views of the directly adjacent meadows and forests and mountains behind. 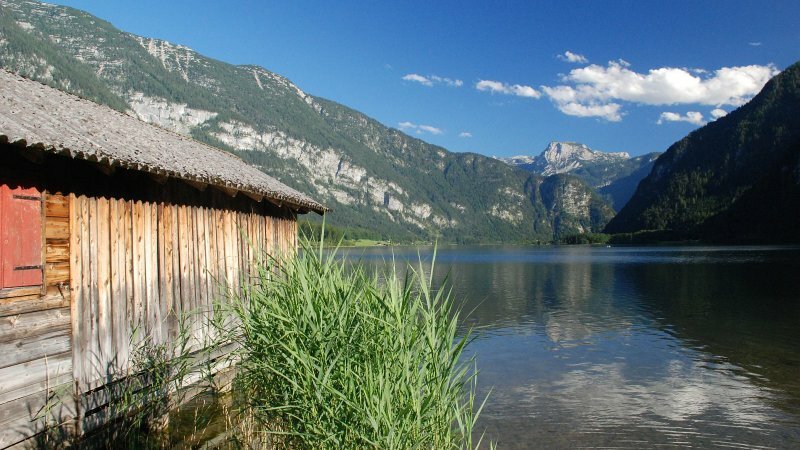 For cooling off during the hot summer months, take a dip in Lake Hallstatt, which is located only a few hundred metres from the holiday home. 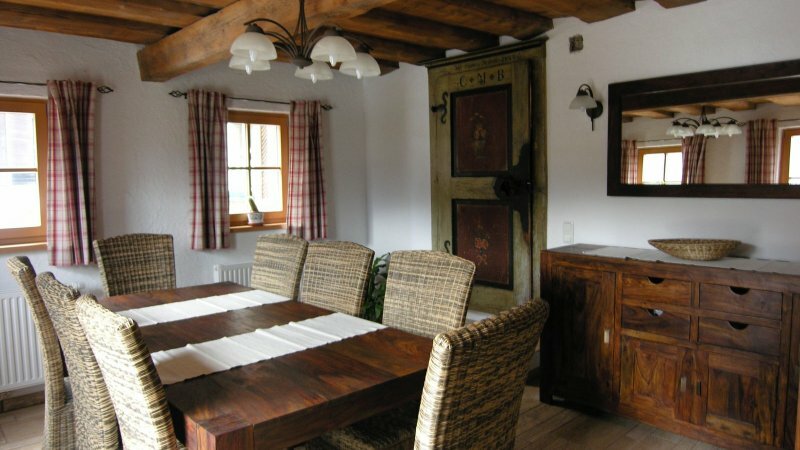 The location of the holiday home is especially ideal for holidaymakers who seek tranquility. 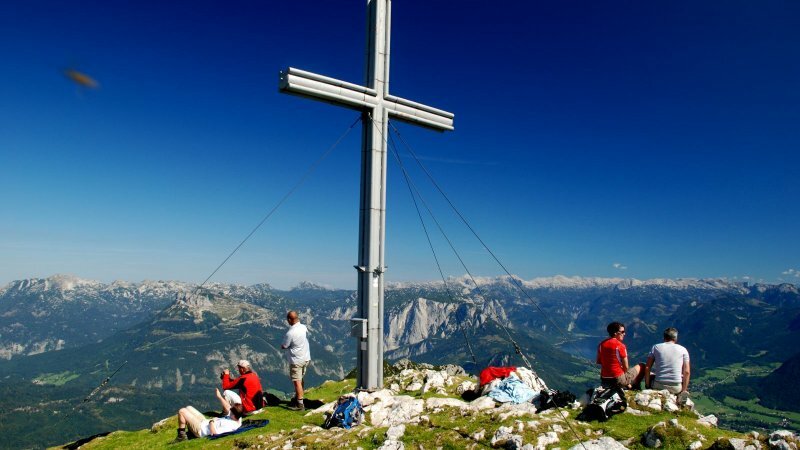 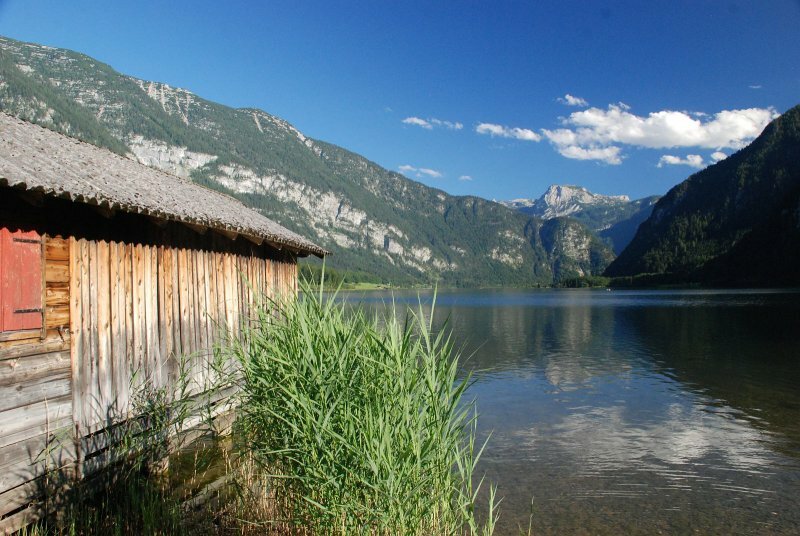 The UNESCO World Heritage region of Hallstatt Dachstein Salzkammergut is known for tradition, its close affinity with nature and incomparably fresh air. 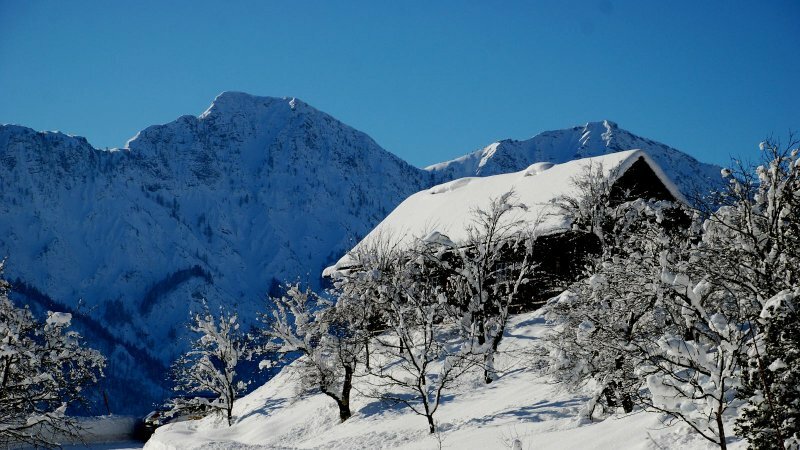 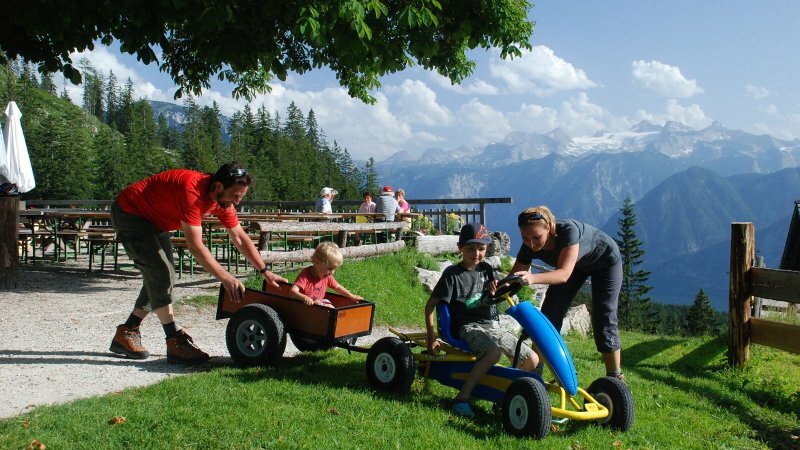 This holiday paradise is surrounded by magnificent mountains, lush alpine pastures, crystal-clear bathing lakes with drinking water quality and countless things to do. 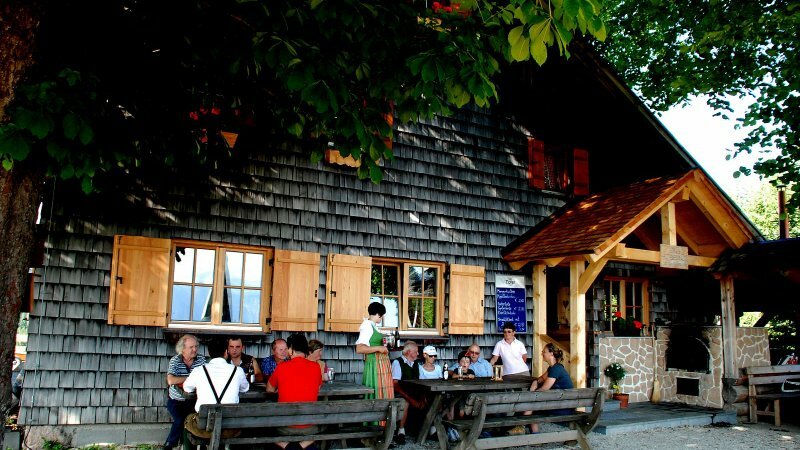 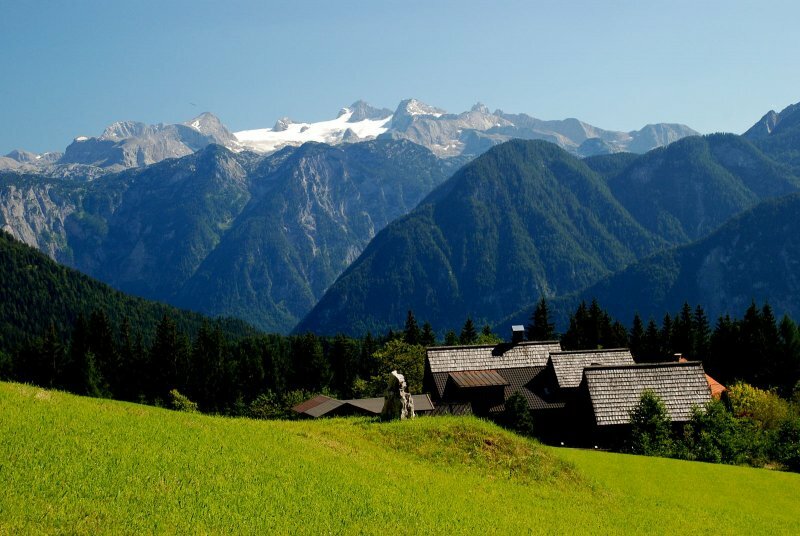 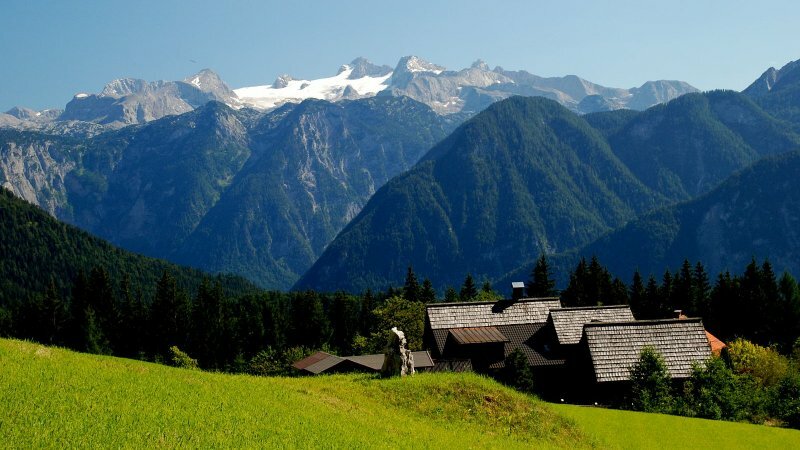 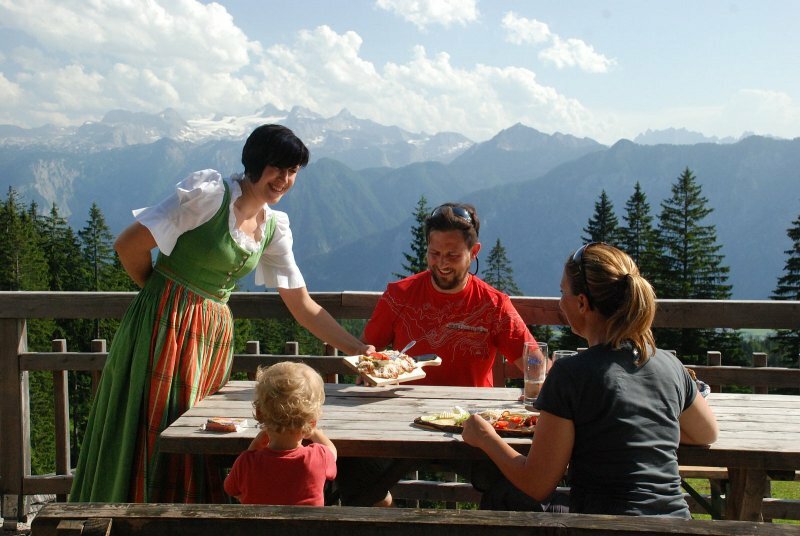 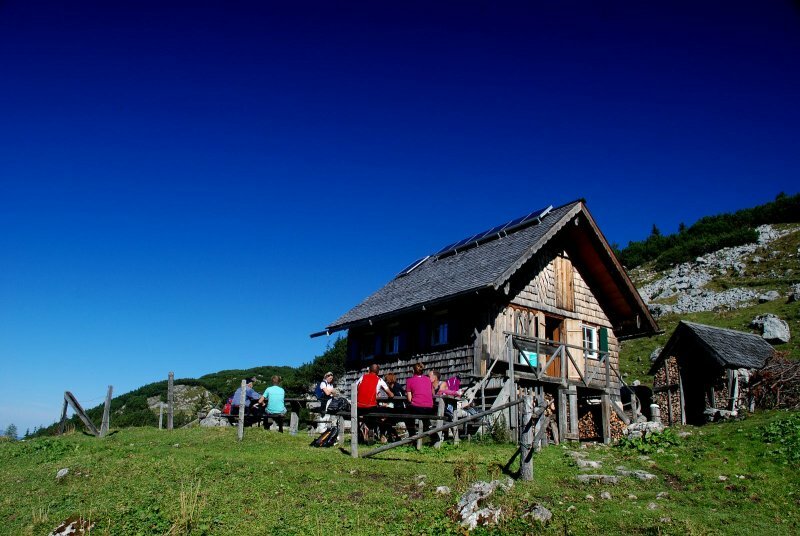 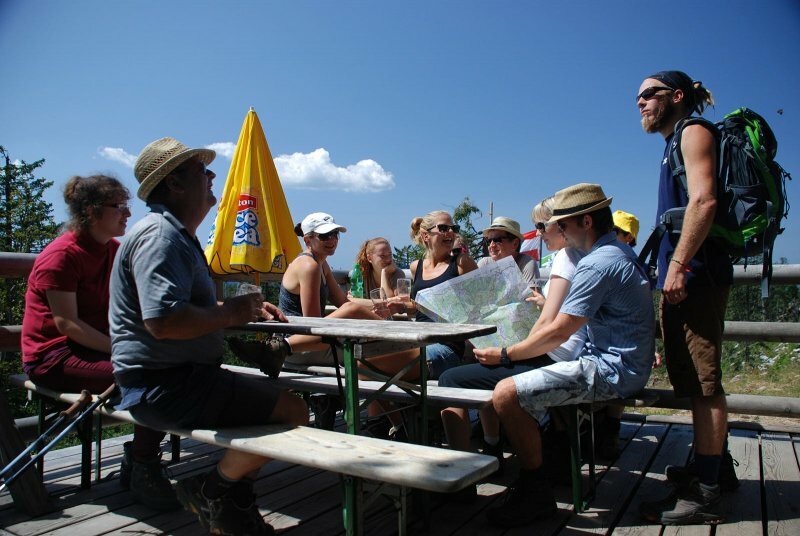 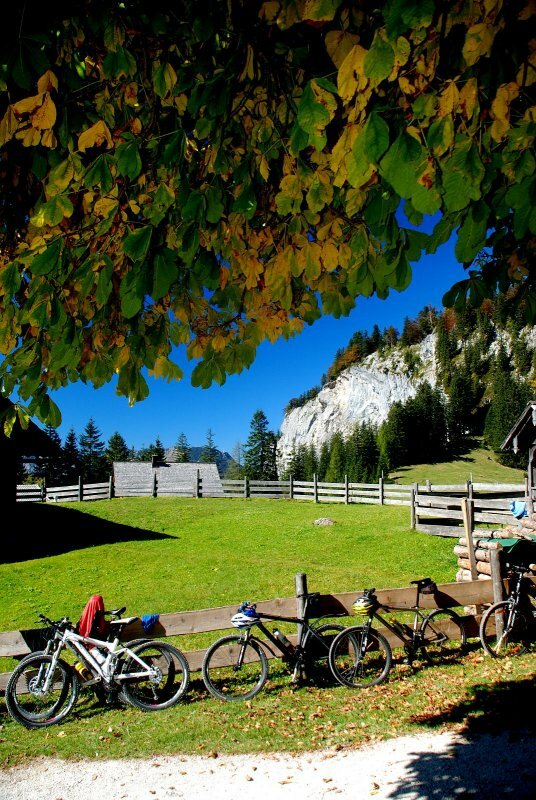 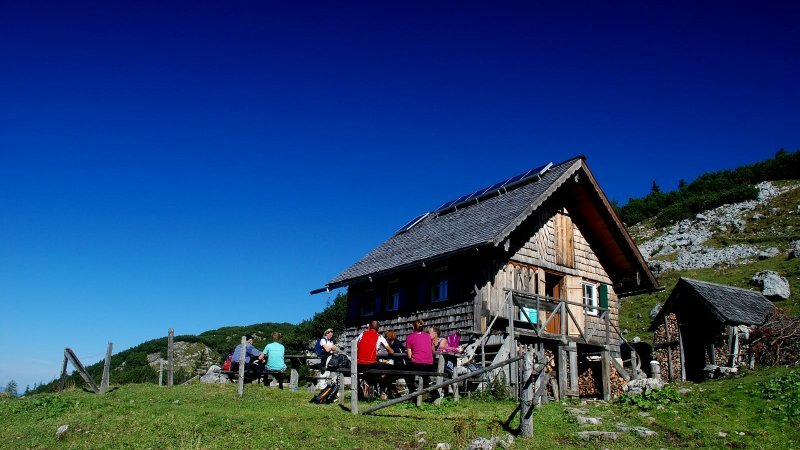 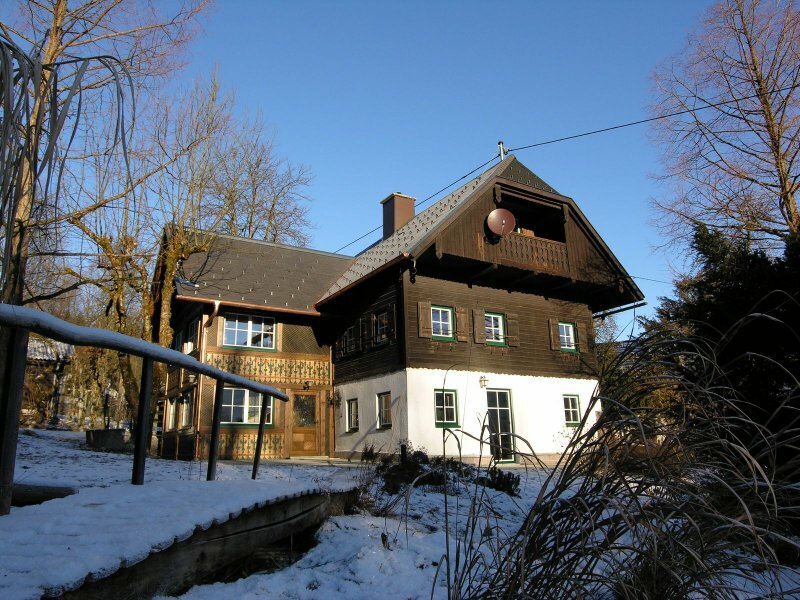 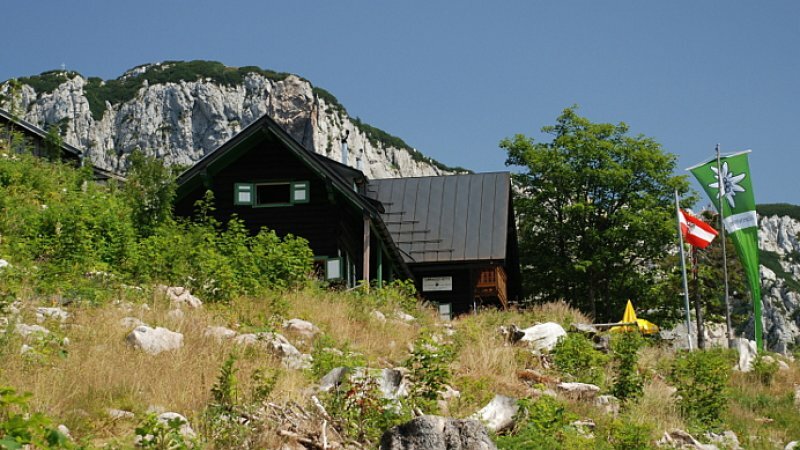 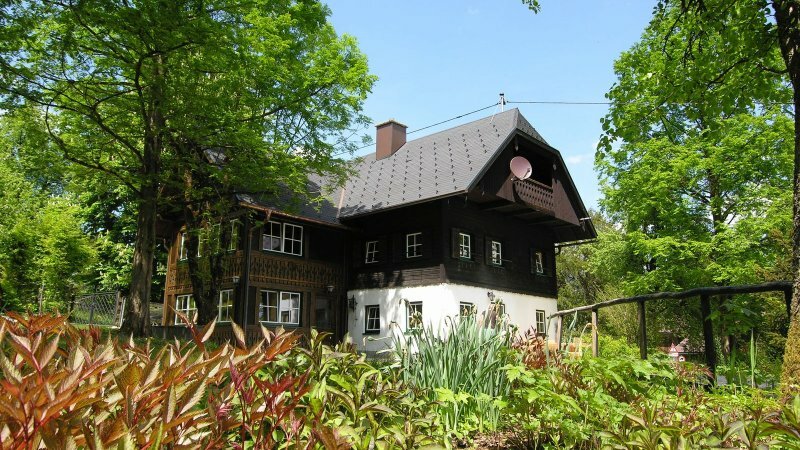 The "Gut Eisenlehen" holiday home is situated in the middle of this beautiful region. 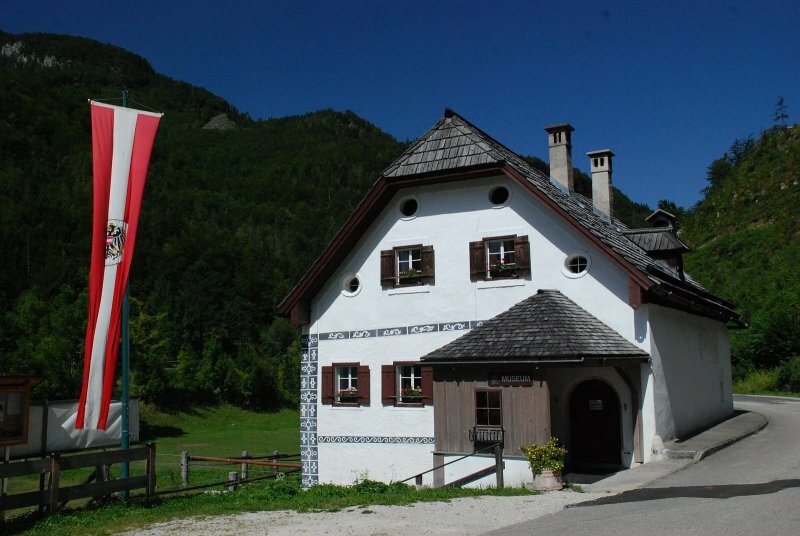 "Gut Eisenlehen" leaves nothing to be desired! 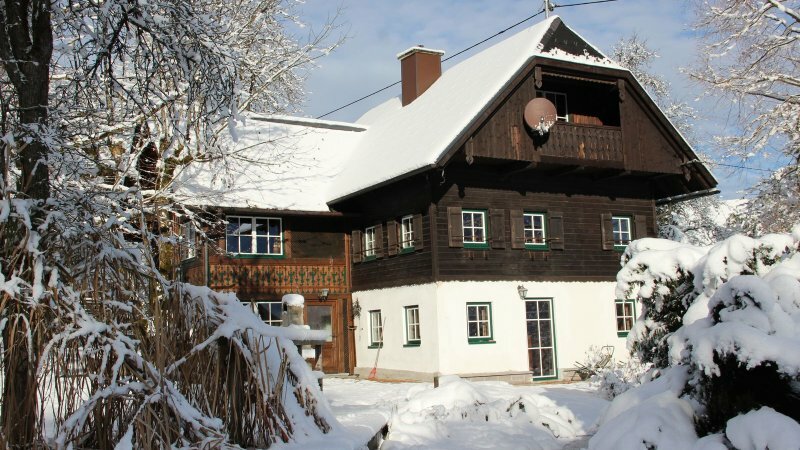 The house has about 170 m² of living space spread over three floors and is explained in detail in the "Layout" section. 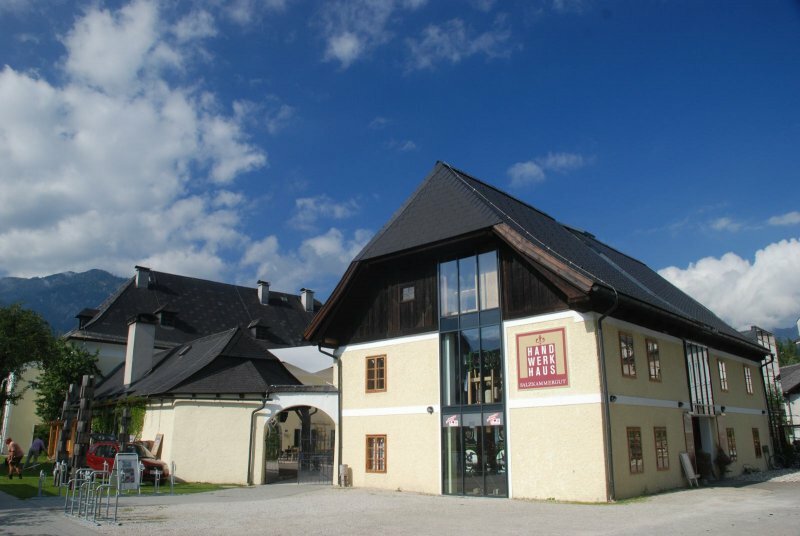 There is also a covered carport for two cars and additional parking outside. 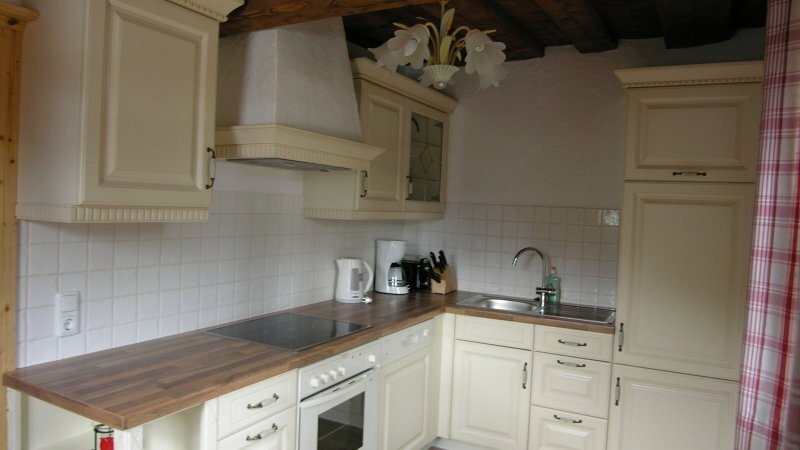 Equally well-fitting to the style of the house is a solid wood fitted kitchen which is fully equipped and leaves nothing to be desired: Electric cooker including ceramic hob and oven, extractor hood, dishwasher, large fridge, freezer, microwave, toaster, kettle, crockery, cutlery, enough cooking pans, glasses etc.. 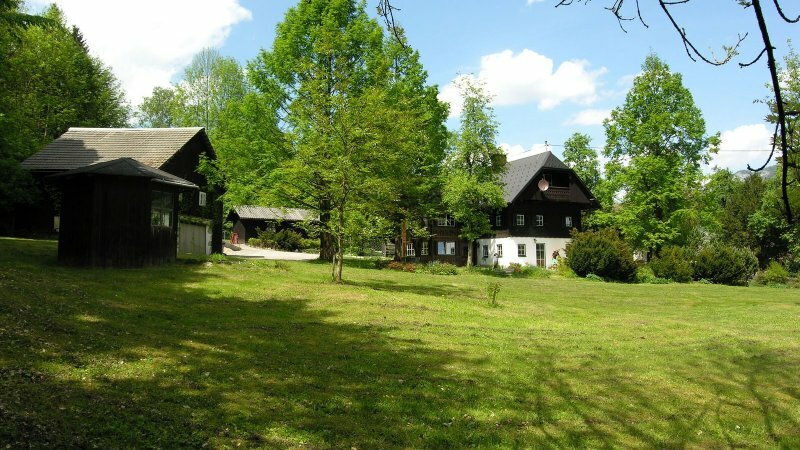 The large sauna is located on the ground floor veranda. 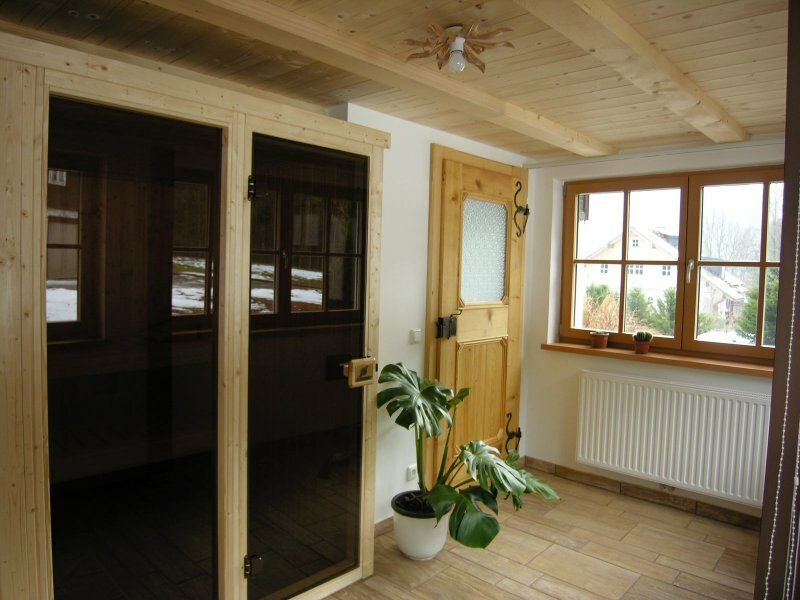 This sauna can accommodate several people and there are also two loungers. 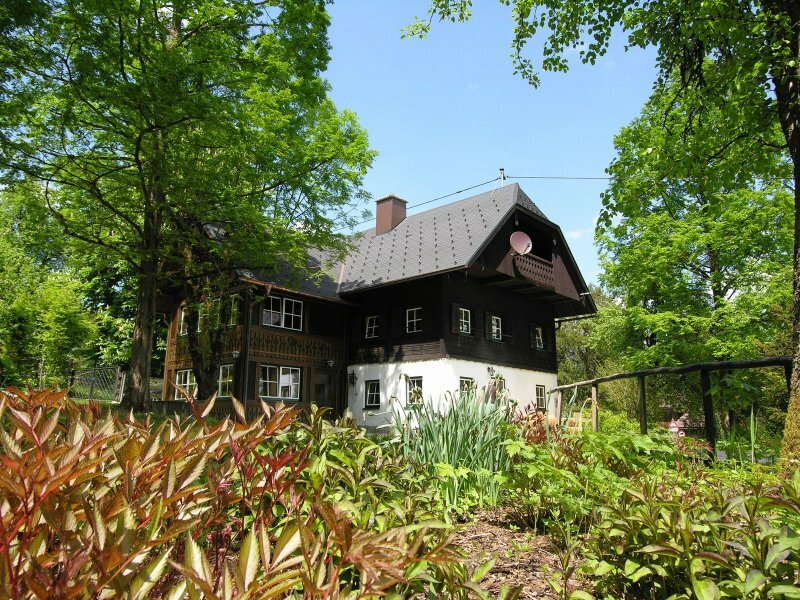 This area is equipped with three large windows so you can enjoy the beautiful view of the garden. 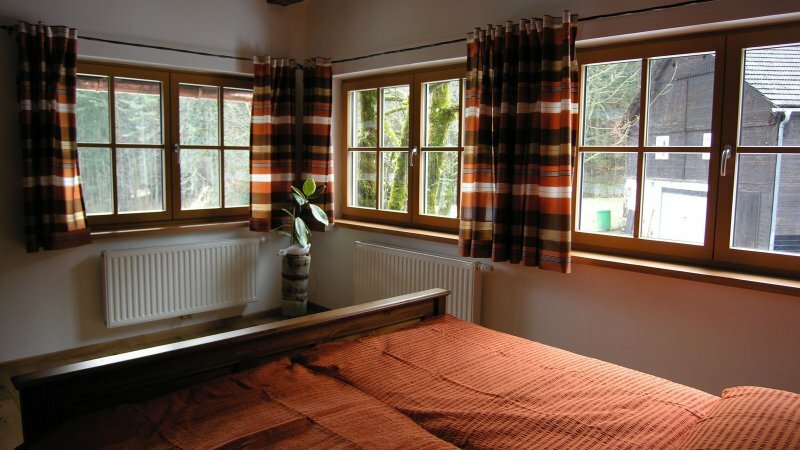 However, these windows can also be fully darkened. 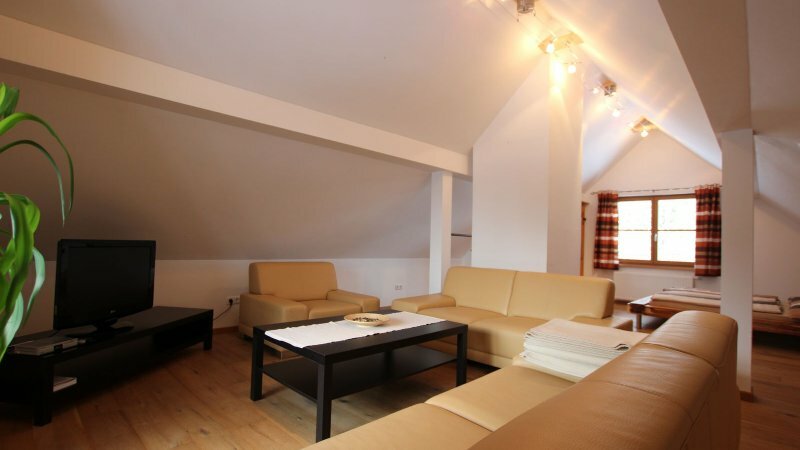 Upstairs are three spacious bedrooms and a luxuriously decorated bathroom. 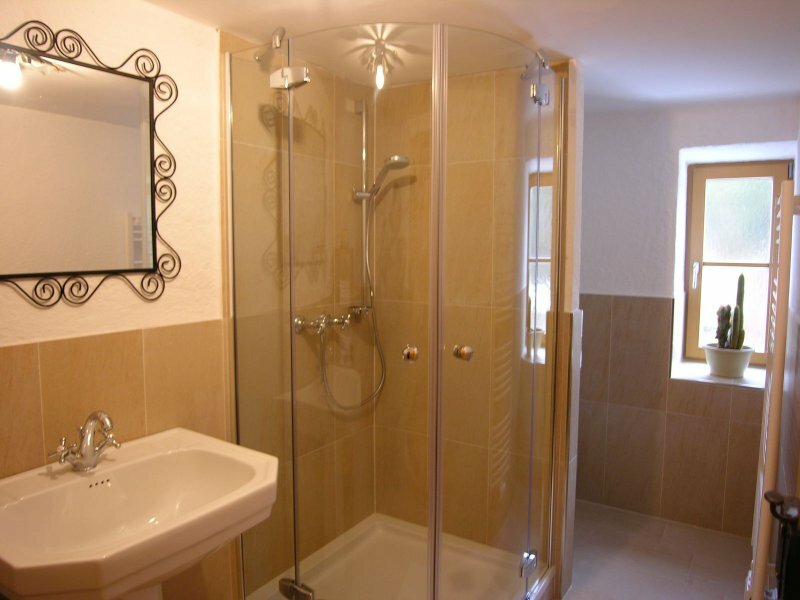 Two of the bedrooms have direct access to the bathroom. 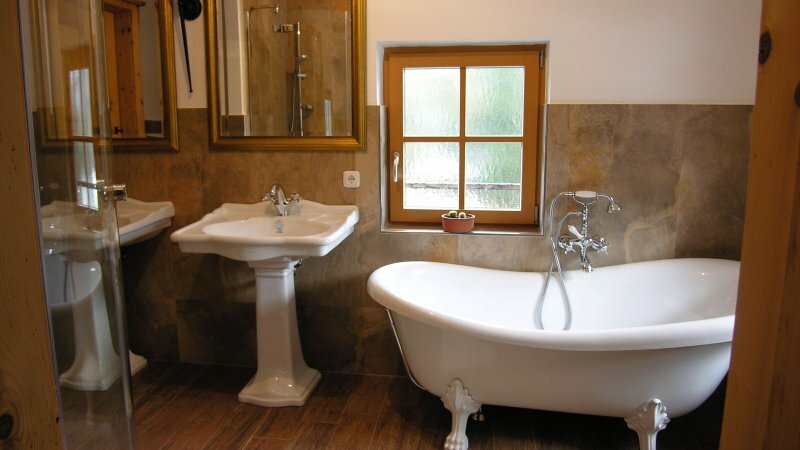 The bathroom sanitary facilities were specially imported from England where the appropriate old style items are still available. 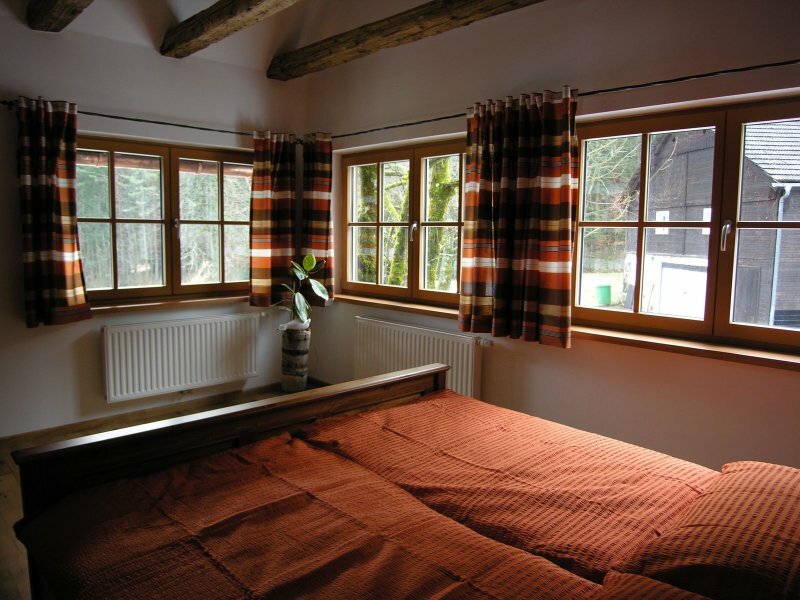 The veranda bedroom is about 17 m² and is equipped with three large windows and therefore very bright and friendly. 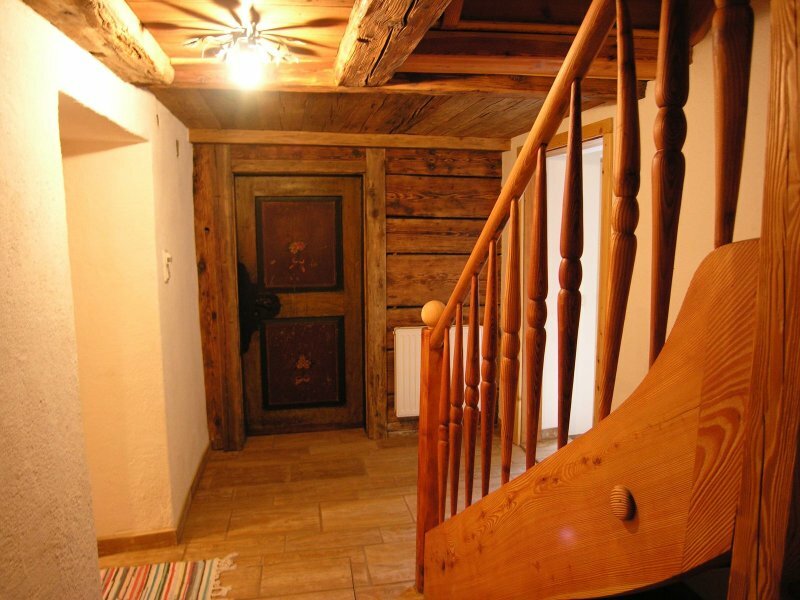 The visible roof structure is constructed with old hand chopped old wooden beams. 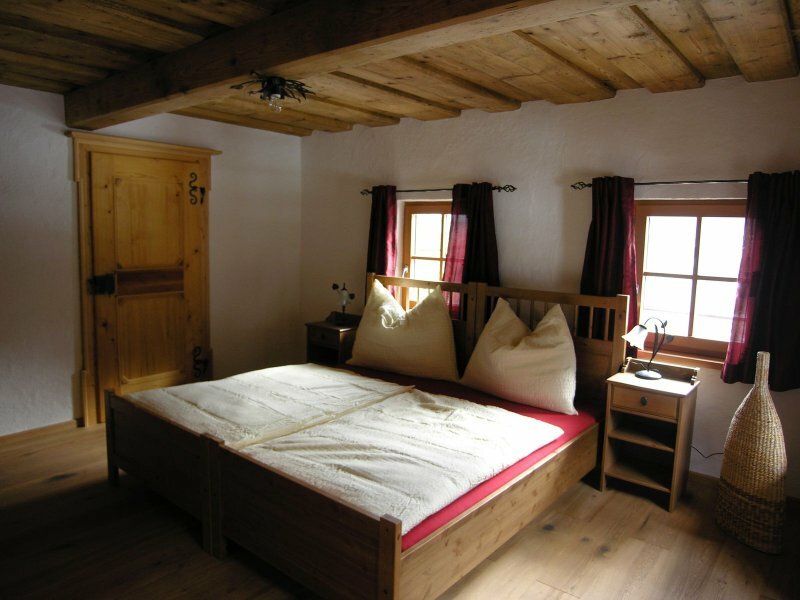 The furniture includes solid wood furniture with a double bed (190 cm), two bedside cabinets and a 5-door wardrobe. 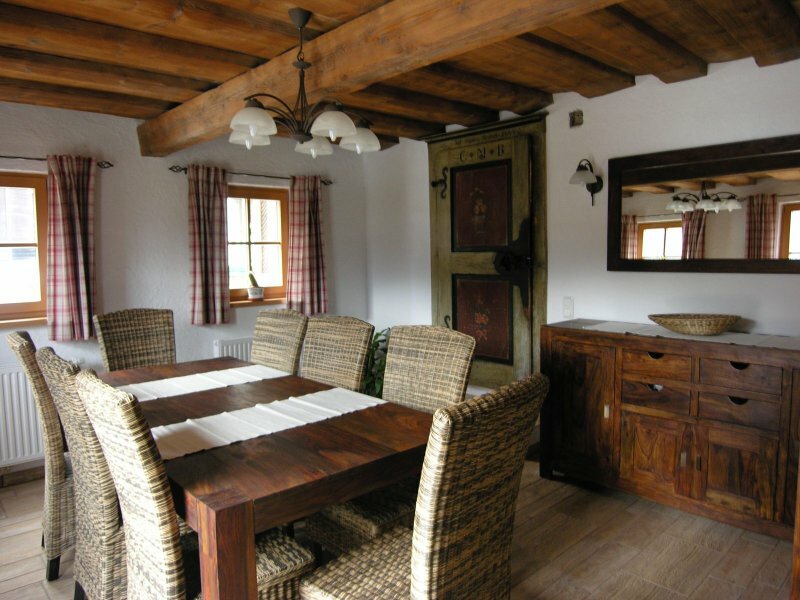 The second bedroom is located above the dining room and is approximately equal in size to the to the veranda bedroom. 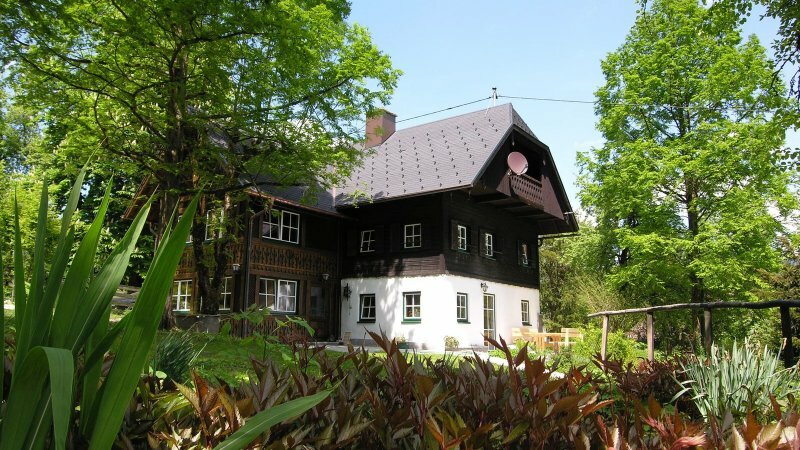 It has four small windows, making for a bright and friendly atmosphere and is equipped with a 500 year old wooden ceiling. 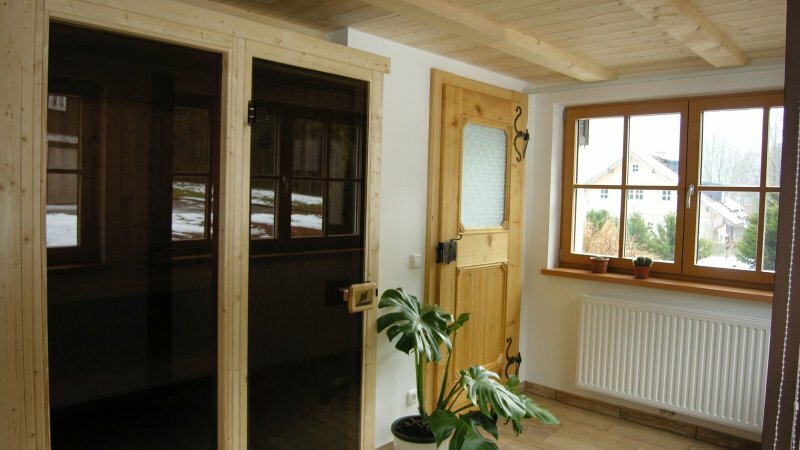 The furniture consists of two single beds (can be combined to make a double bed), two bedside cabinets and a 4-door wardrobe. 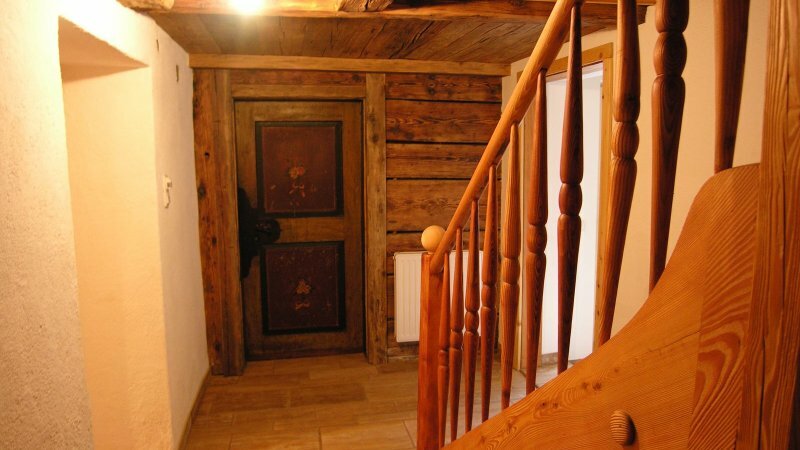 From this room there is direct access to the bathroom. 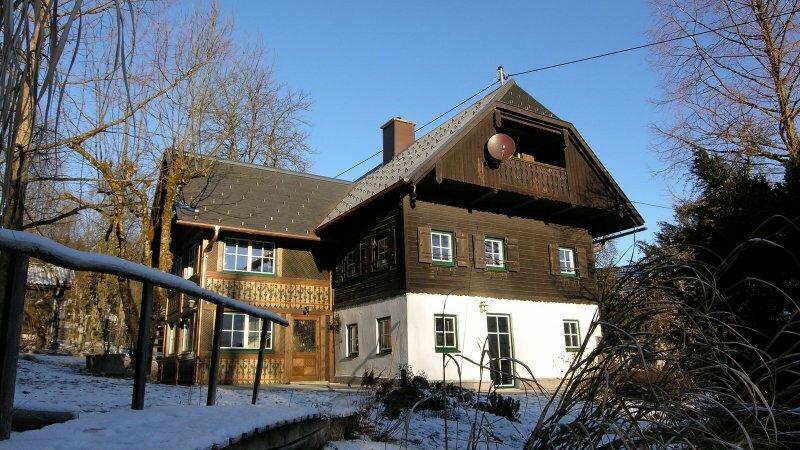 The third bedroom is located on the northeast side of the house and it is the smallest of the three bedrooms. 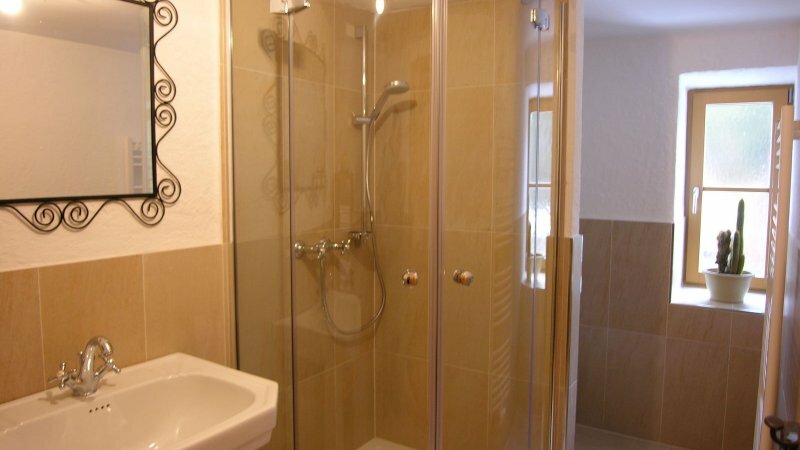 Also this room leads directly into the bathroom, whereby the two bathroom doors are lockable on both sides. 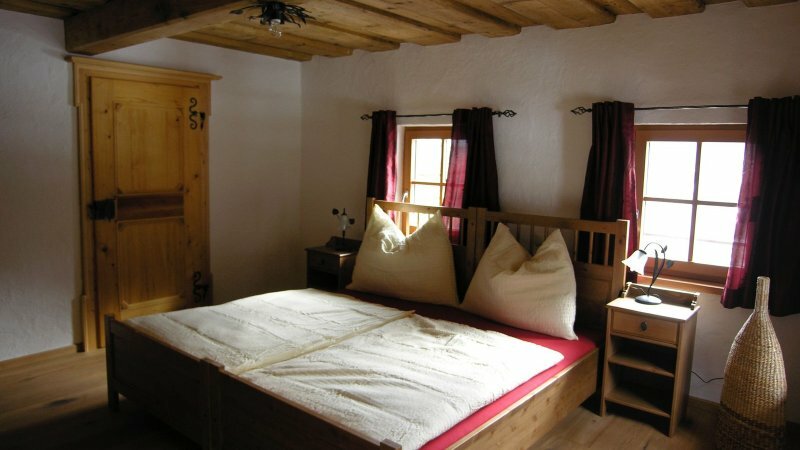 The furniture consists of a 140 cm double bed, two bedside cabinets and a two-door wardrobe. 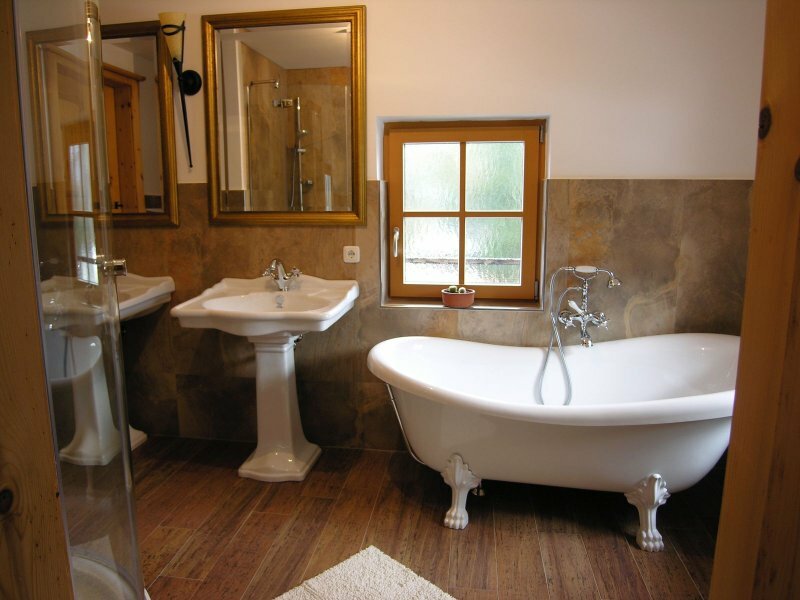 The bathroom upstairs is equipped with a freestanding cast stone bathtub, a 90 cm shower, toilet, two sinks and two antique mirrors. 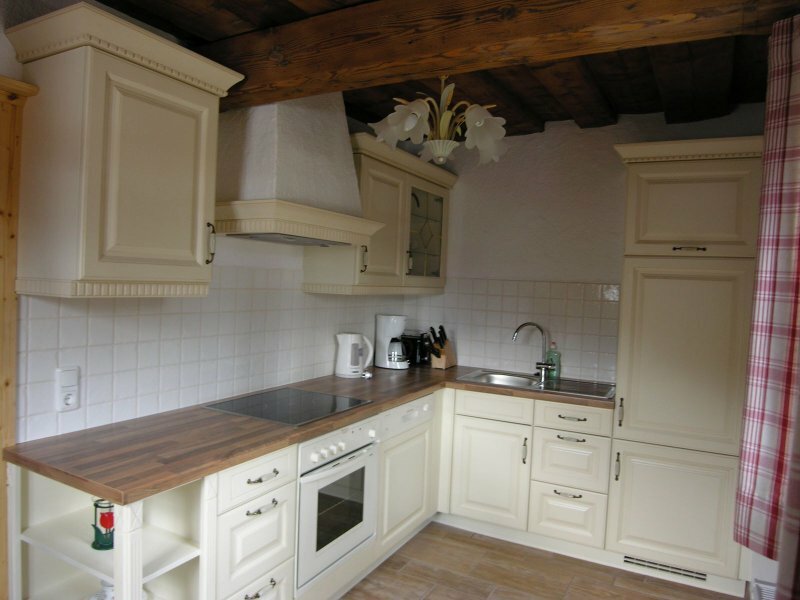 A wooden shelf can be used to store towels and other utensils. 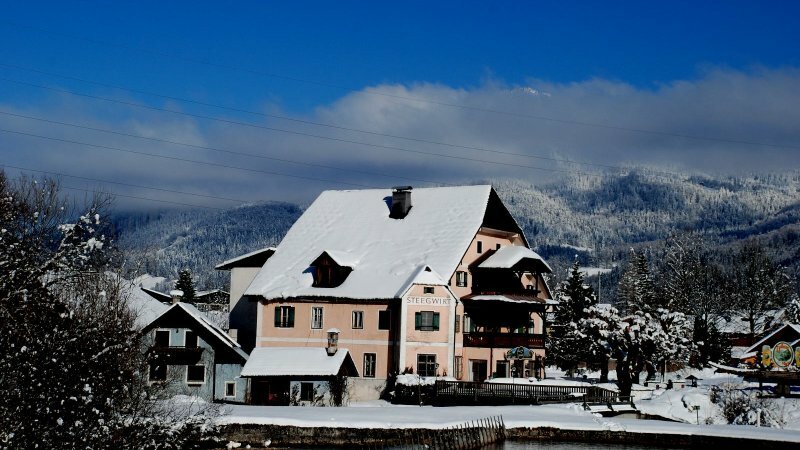 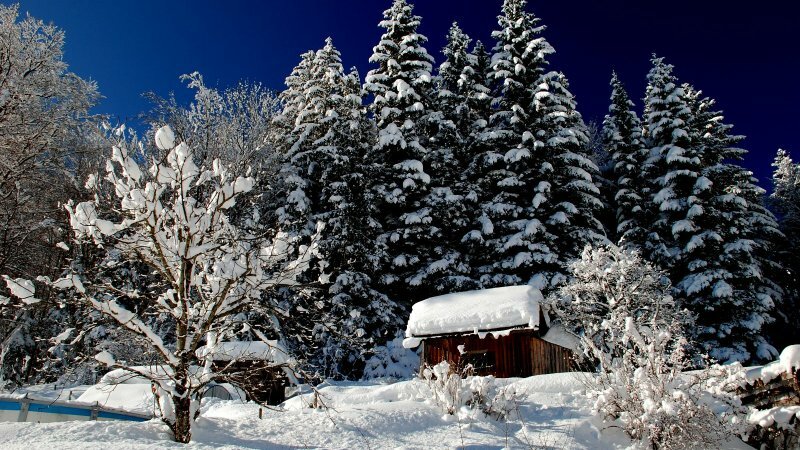 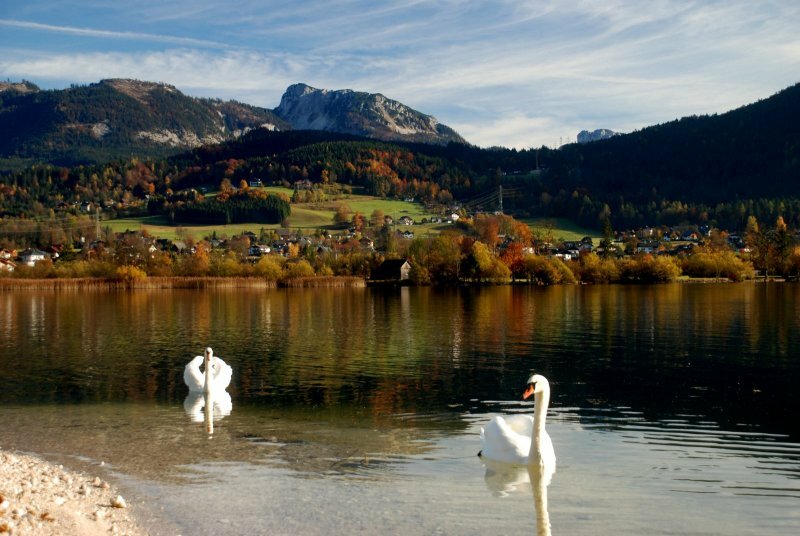 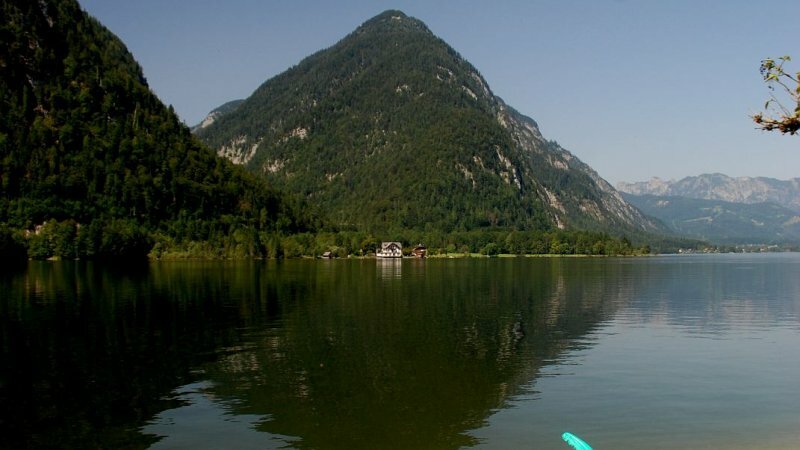 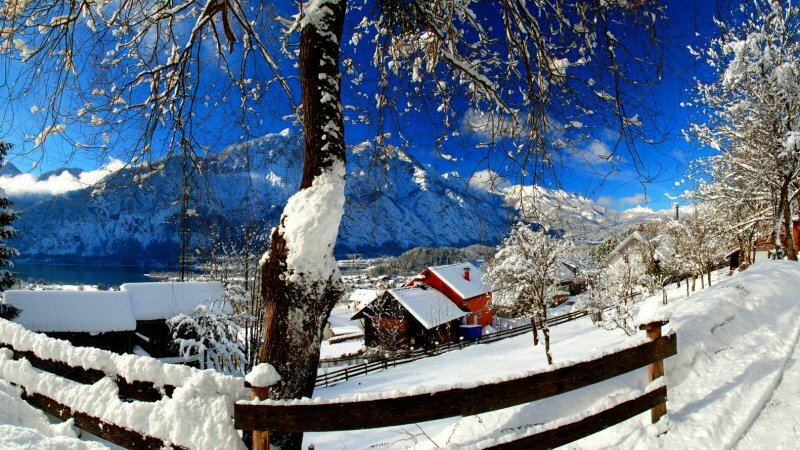 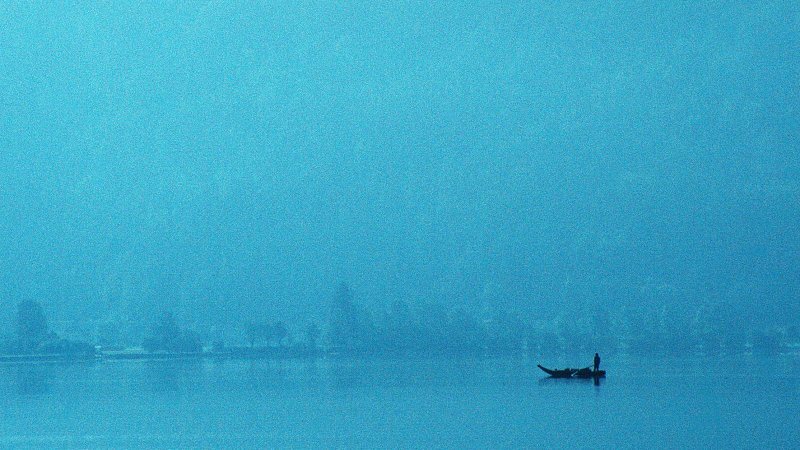 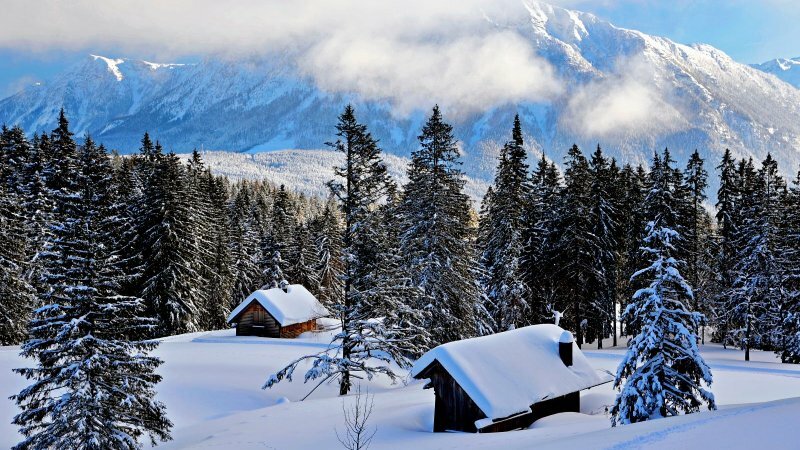 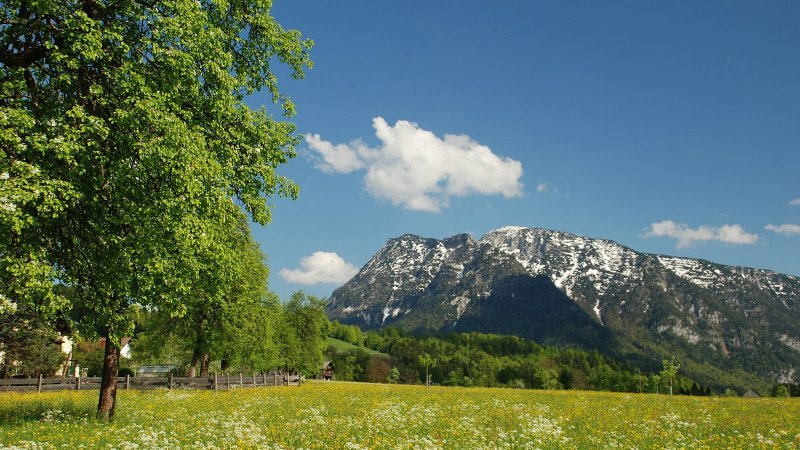 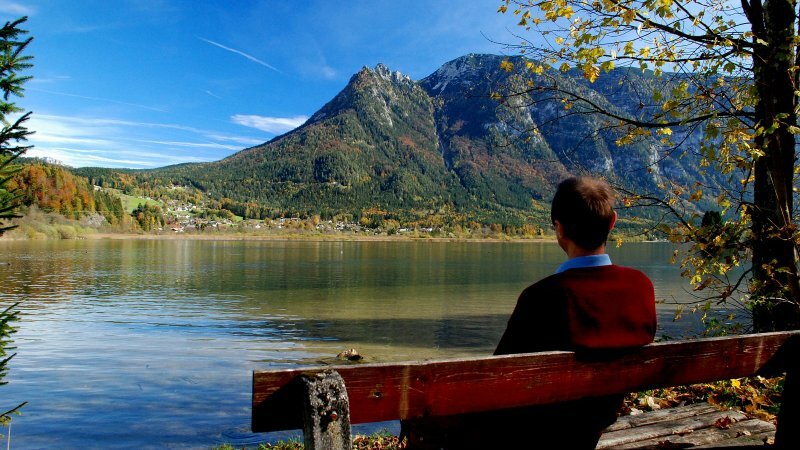 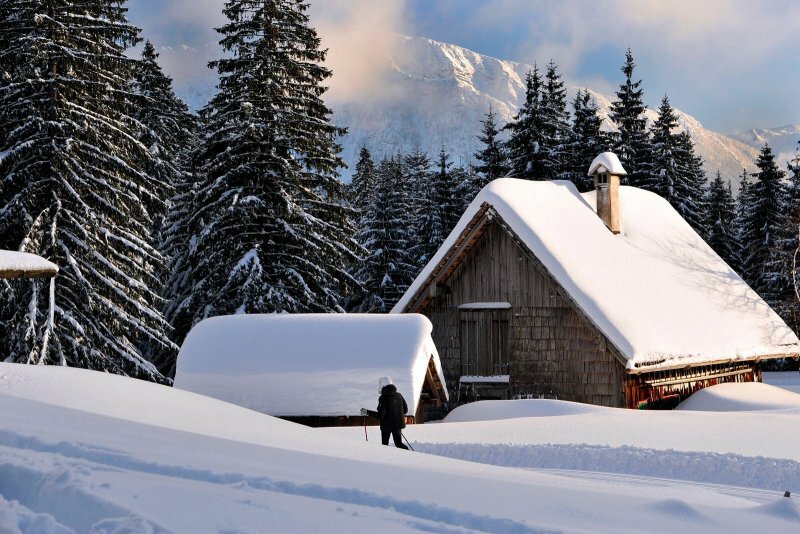 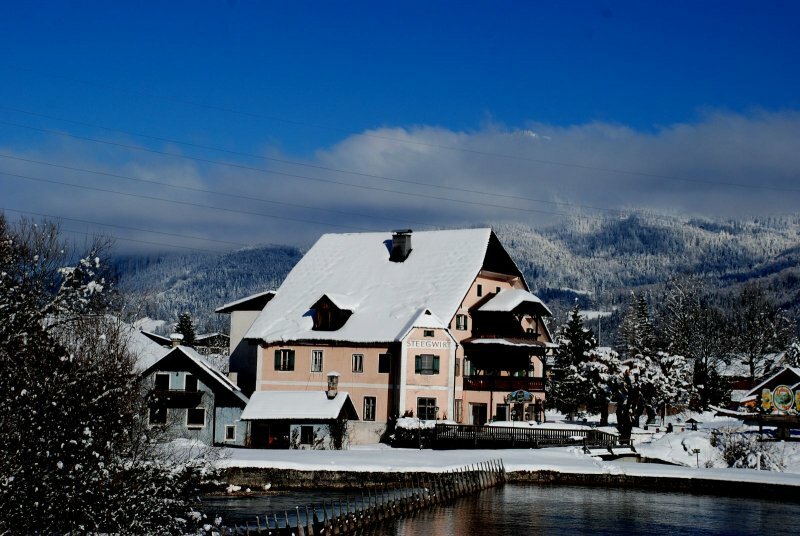 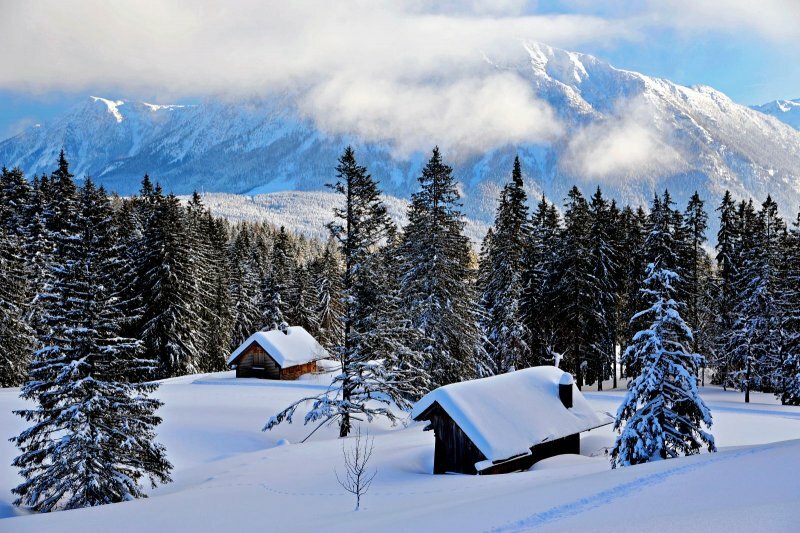 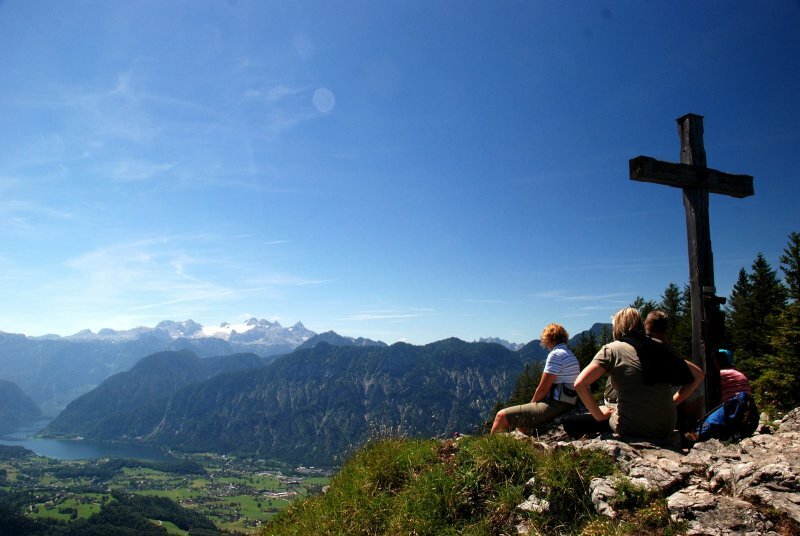 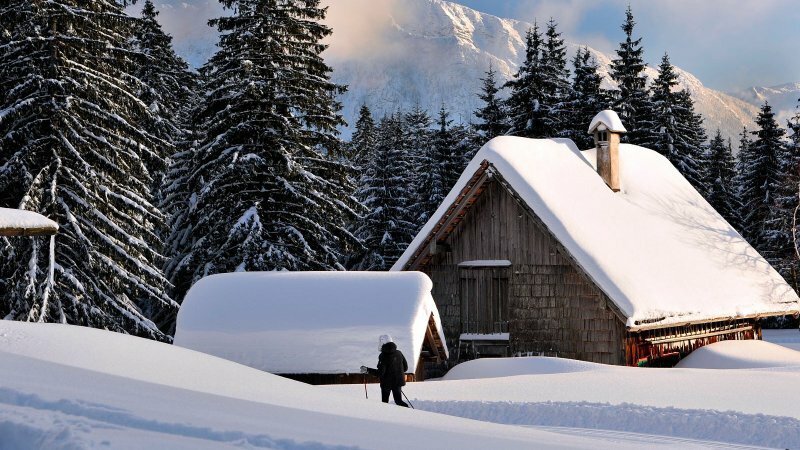 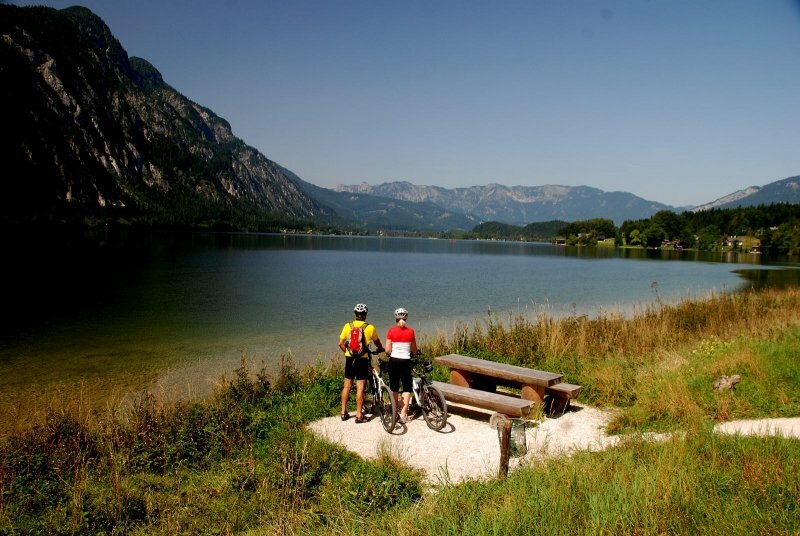 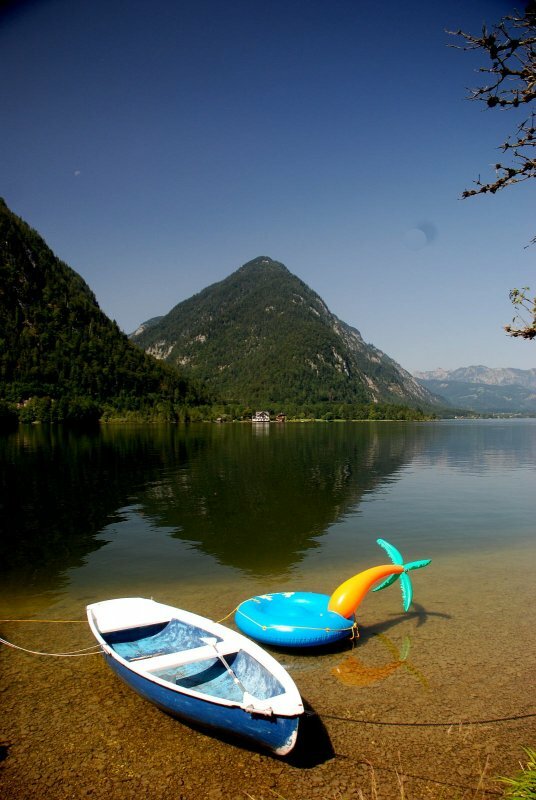 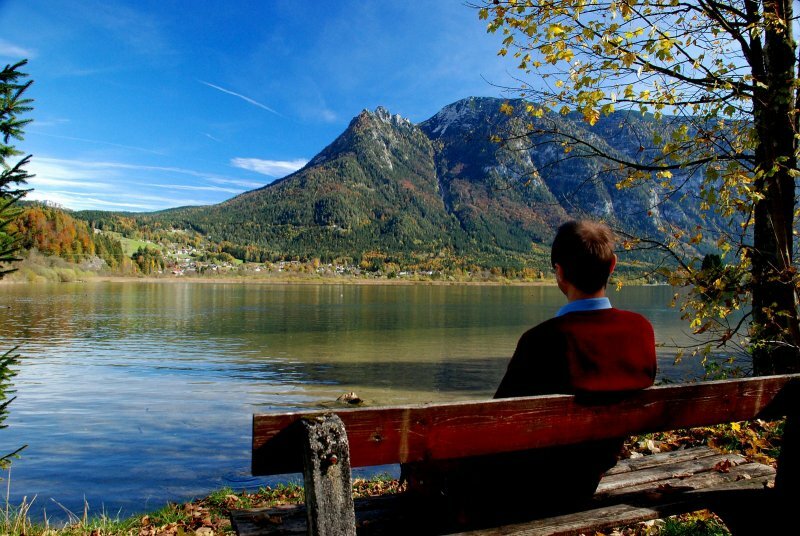 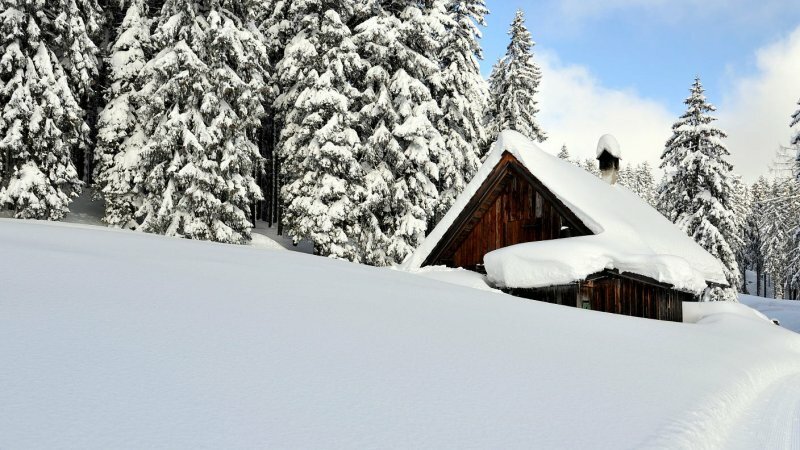 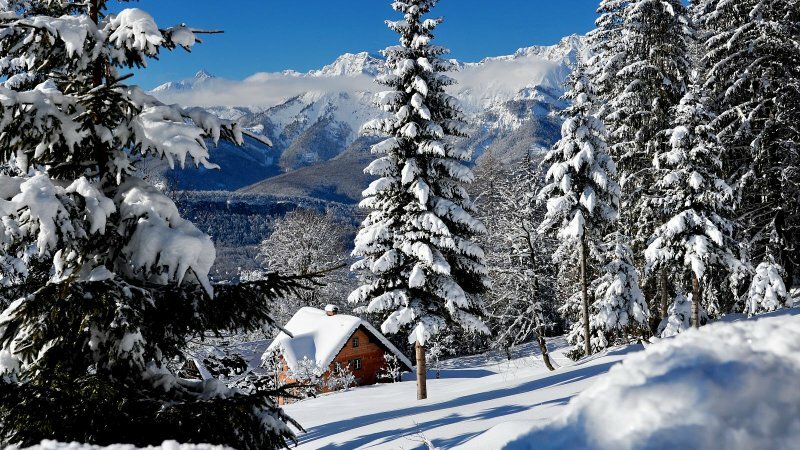 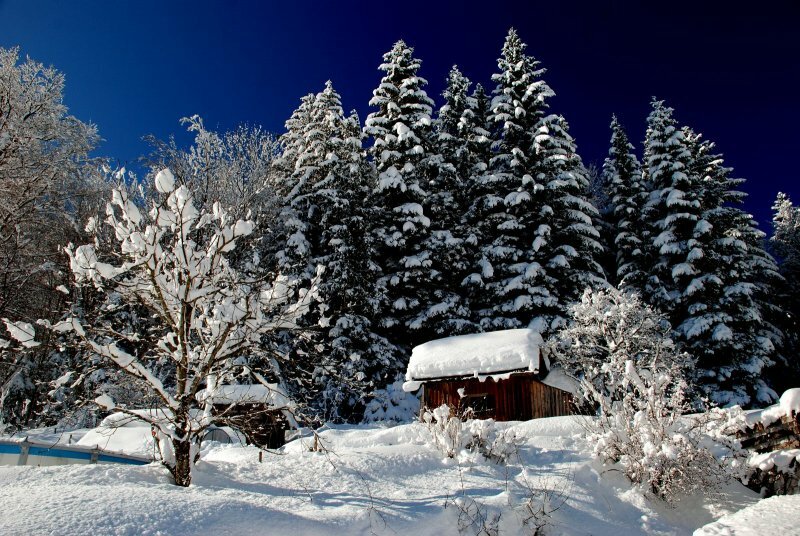 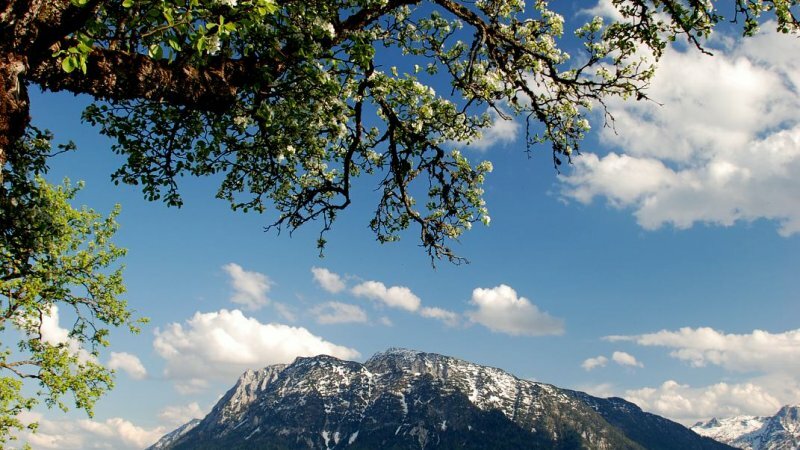 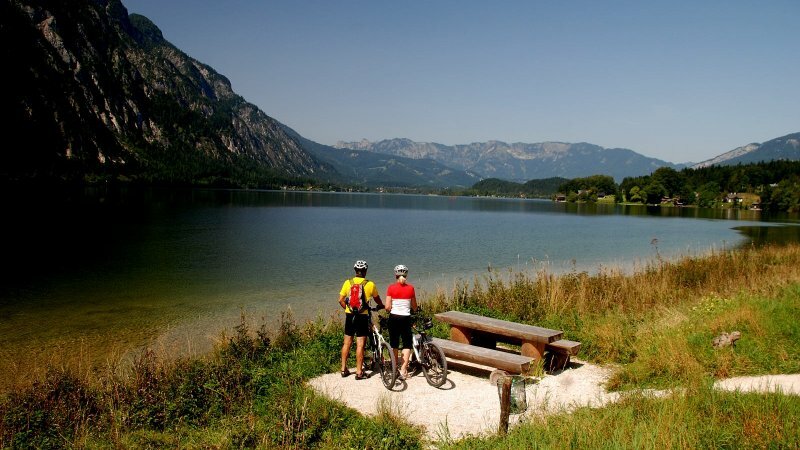 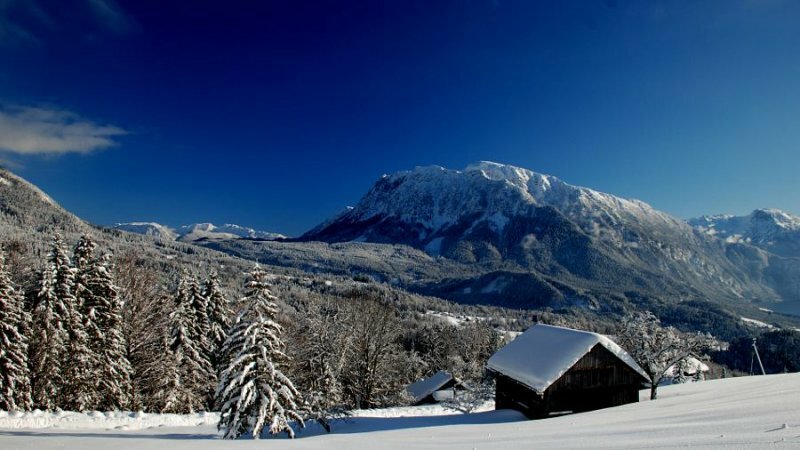 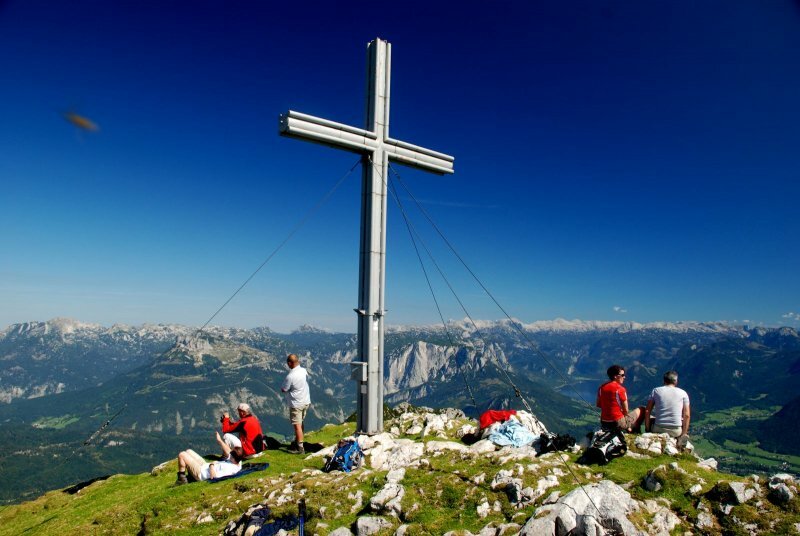 In both summer and winter, the Salzkammergut and in particular the Inner Salzkammergut are at its best. 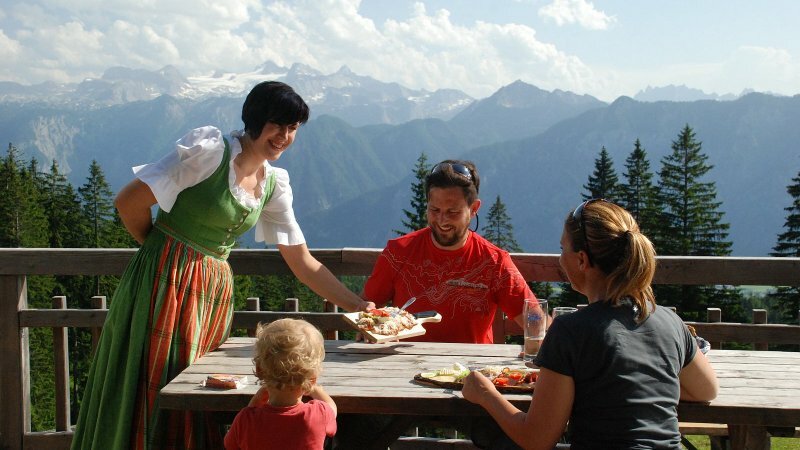 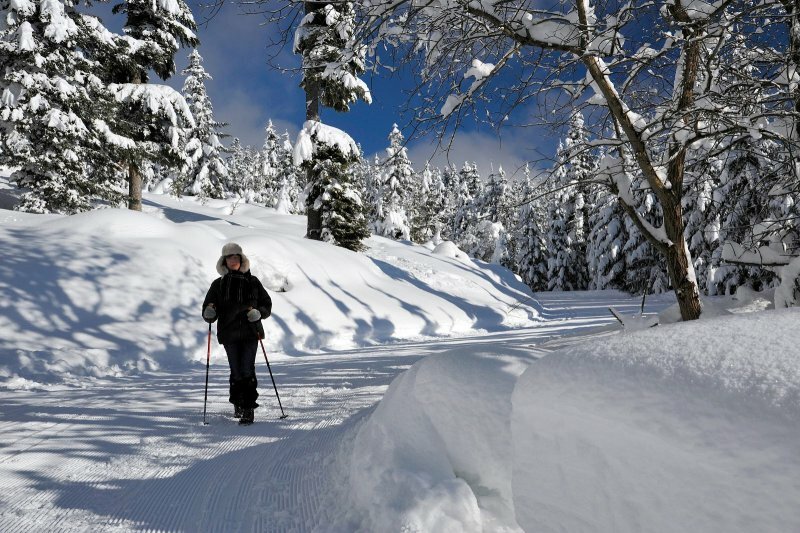 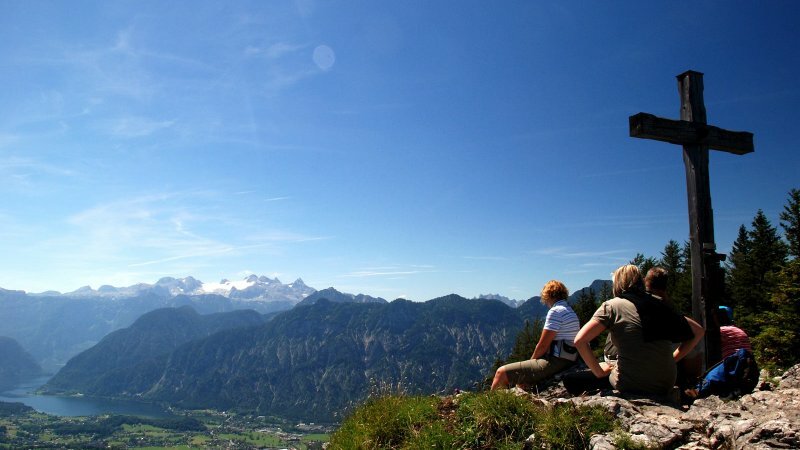 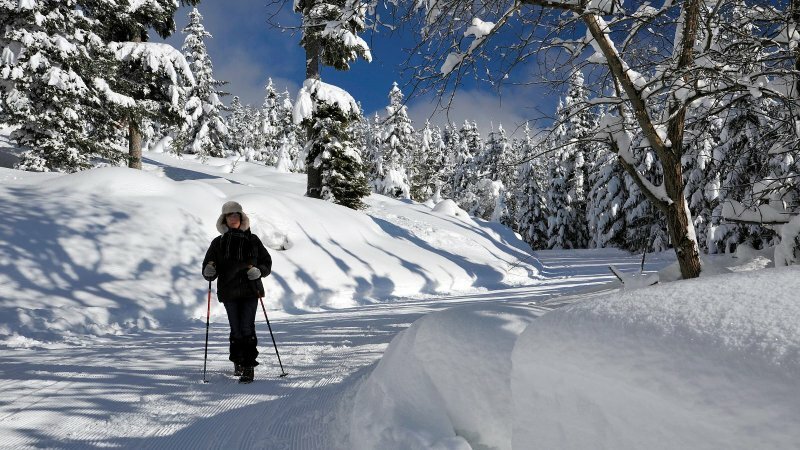 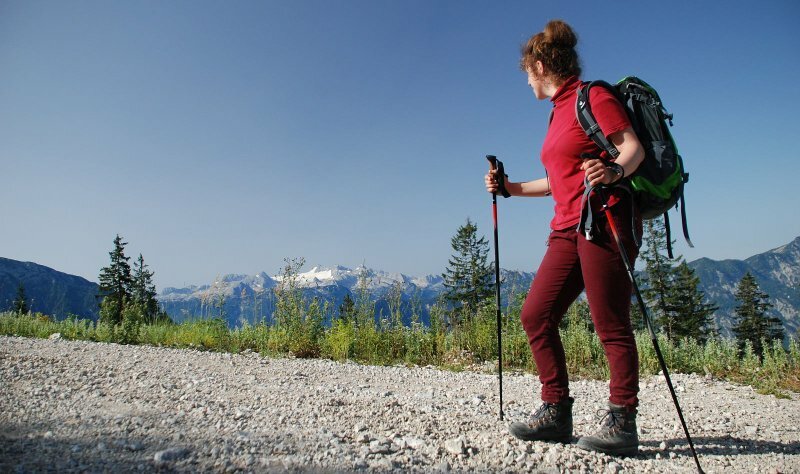 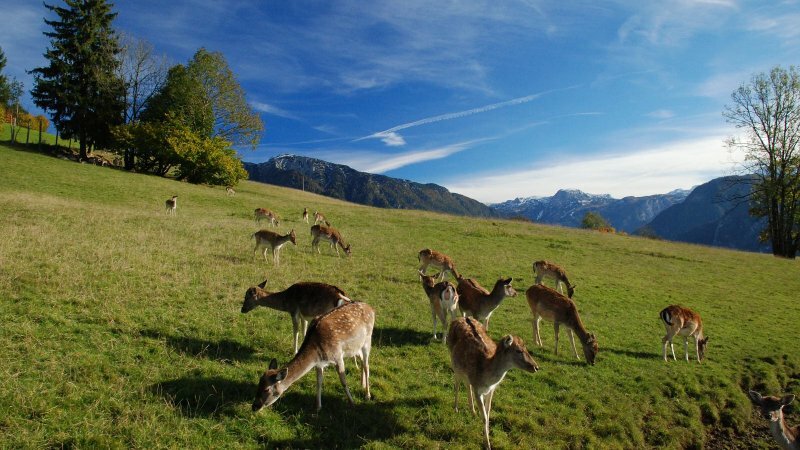 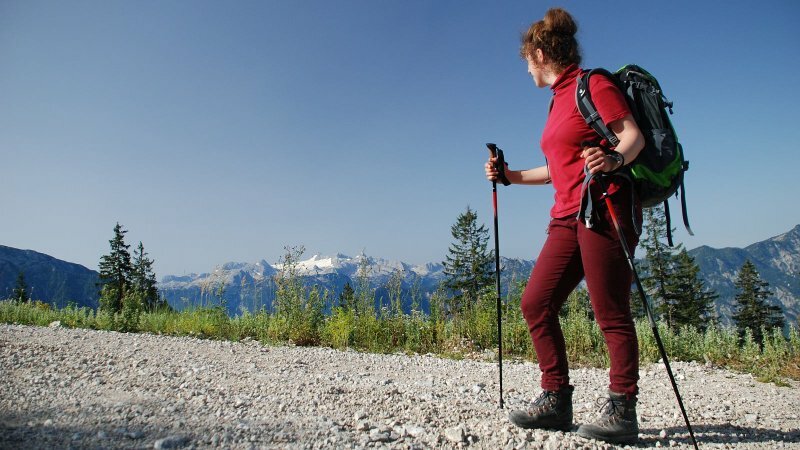 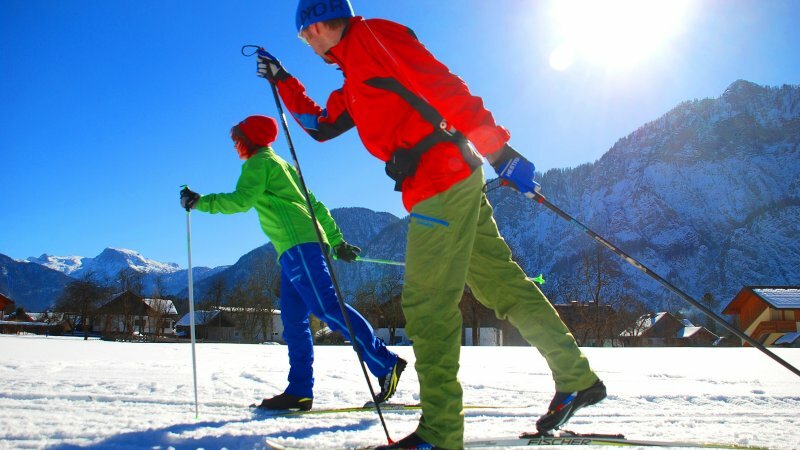 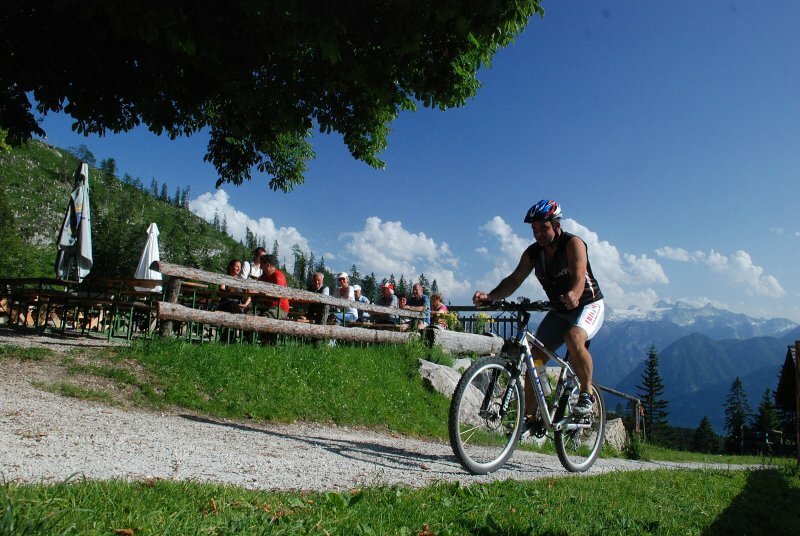 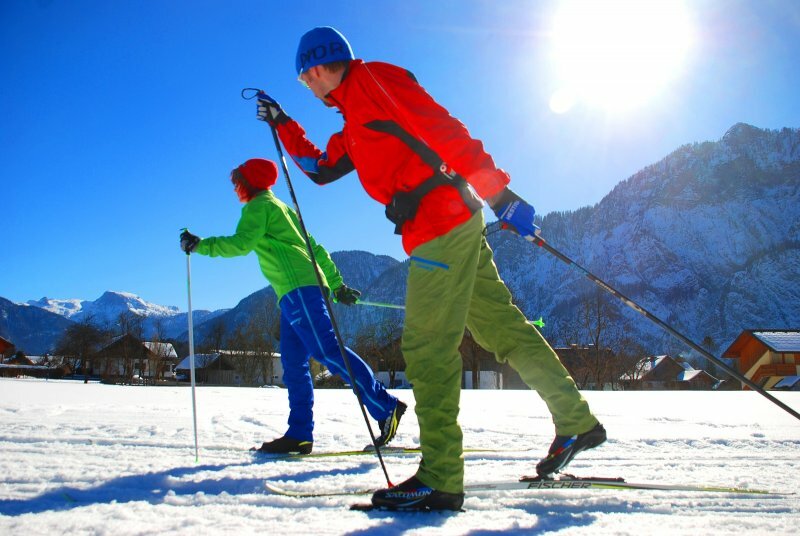 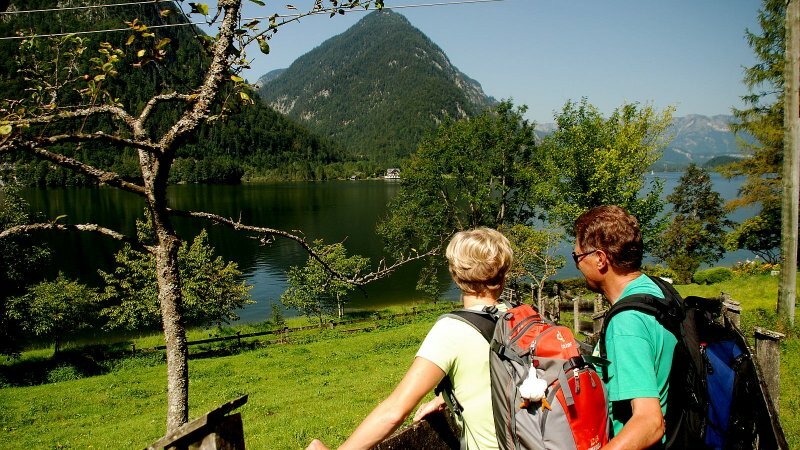 Whether for an active holidaymaker or those looking for some carefree days - the "Gut Eisenlehen" is the perfect feel-good place for any kind of family or active holiday. 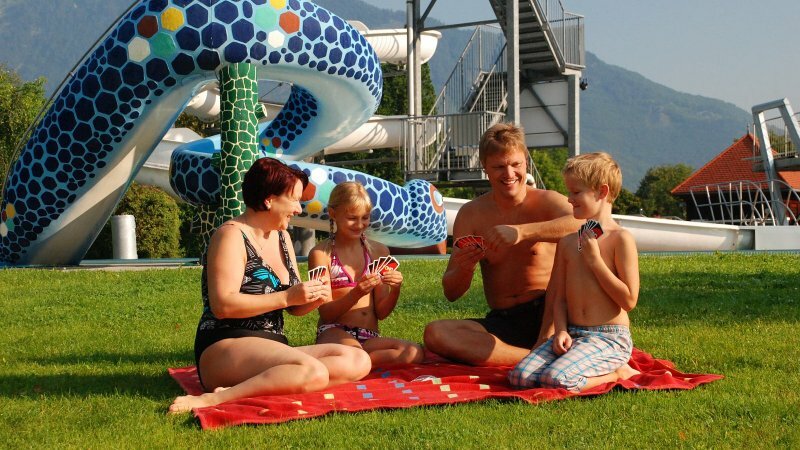 In the high season, our holiday home is only available to rent on a weekly basis from Saturday to Saturday. 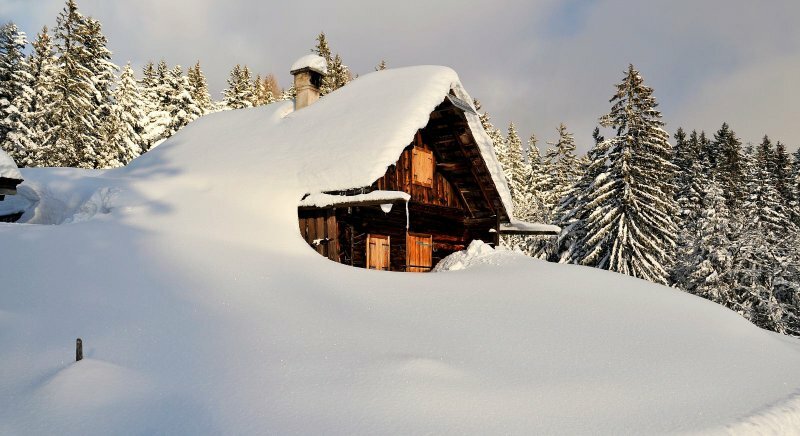 If you are unable to stay within this time, we are still flexible if the reservation conditions permit - just ask. 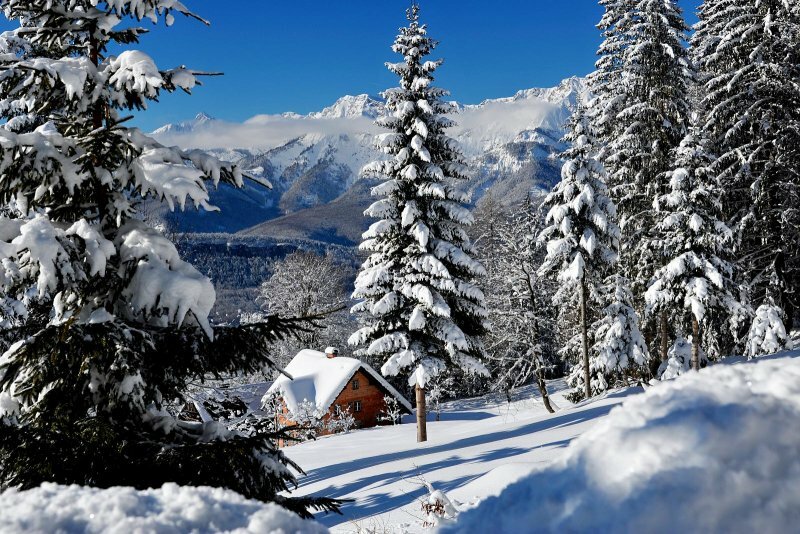 In the low season, we can reduce the length of stay to at least three days. 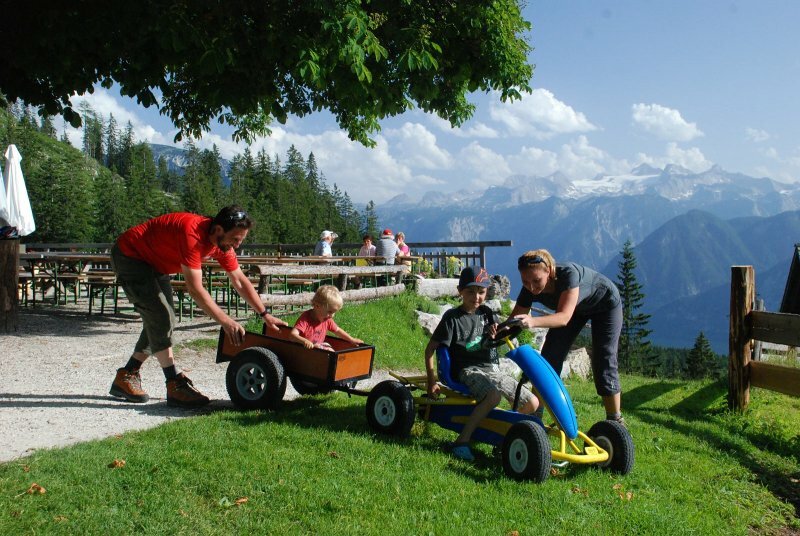 Flexible arrival and departure days are available on request. 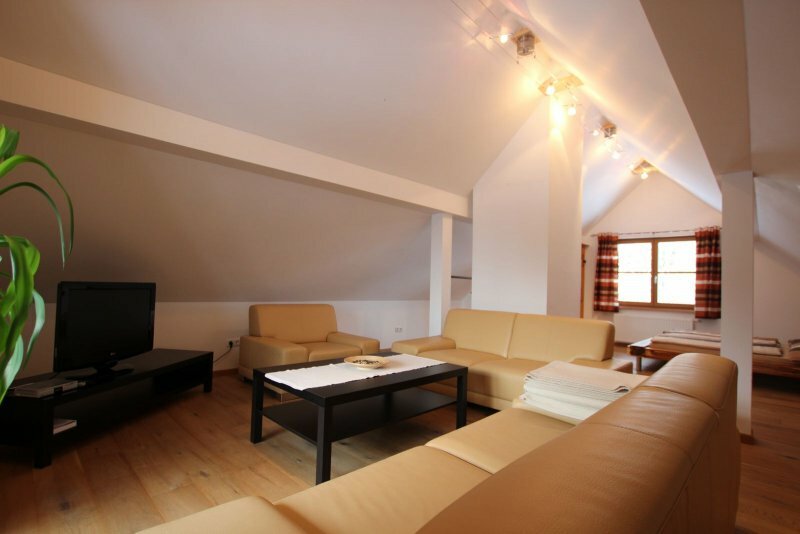 The rates above are for up to 8 people plus tax. 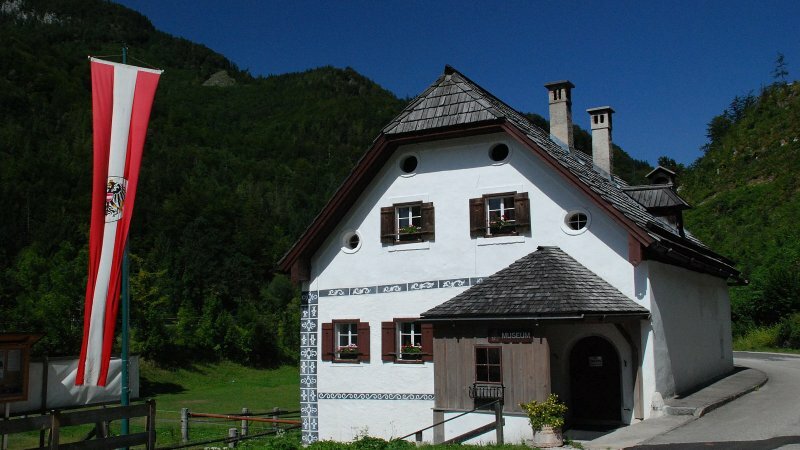 Wood briquettes for stove are obtainable from us and cost between € 3, - and € 3.50 per package depending on the purchase. 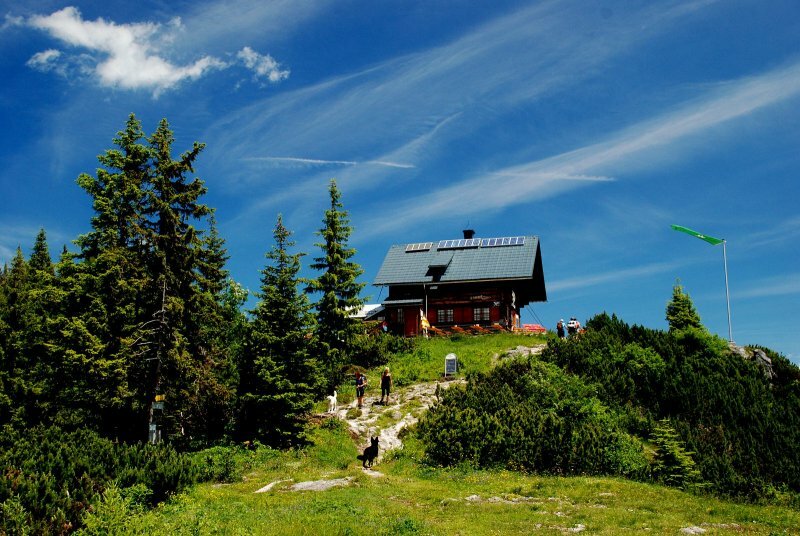 Consumption costs are based on your personal consumption and are charged according to the meter readings. 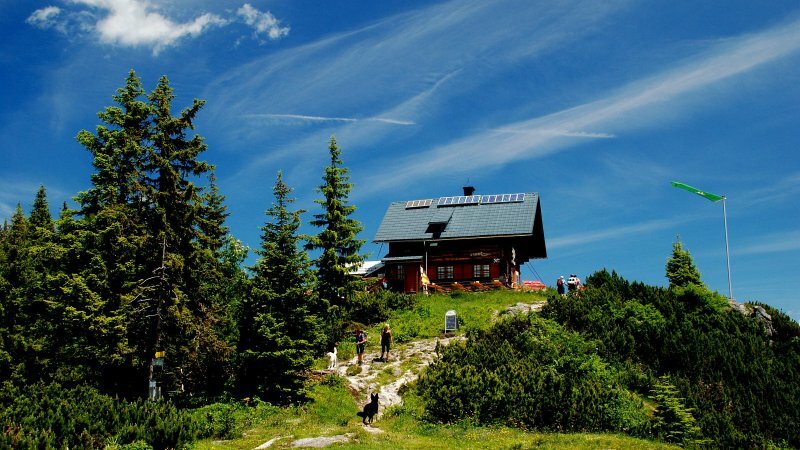 As the house has a solar heater, which supplies both the hot water, the heating costs in spring, summer and autumn are relatively low. 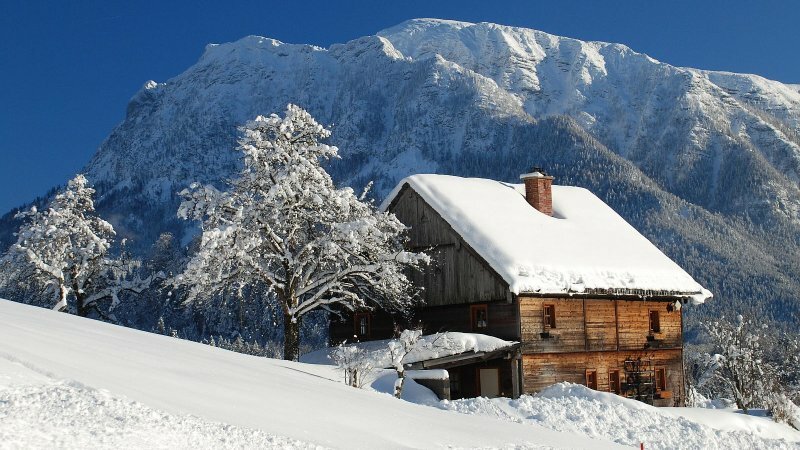 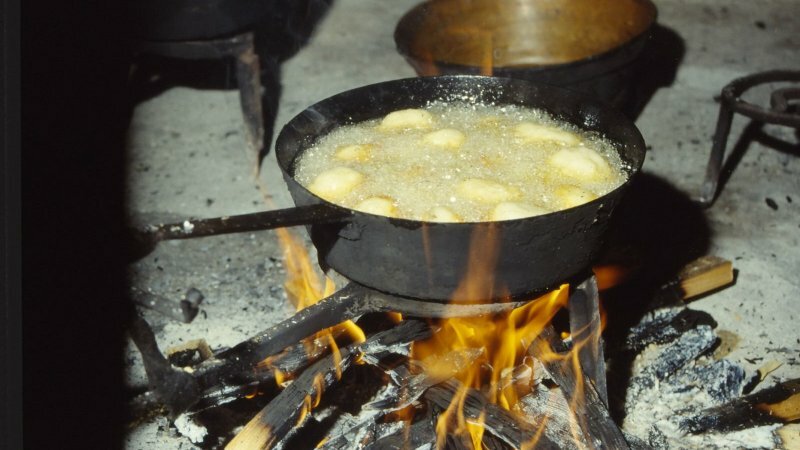 Only in winter does it need to be heated with electricity. 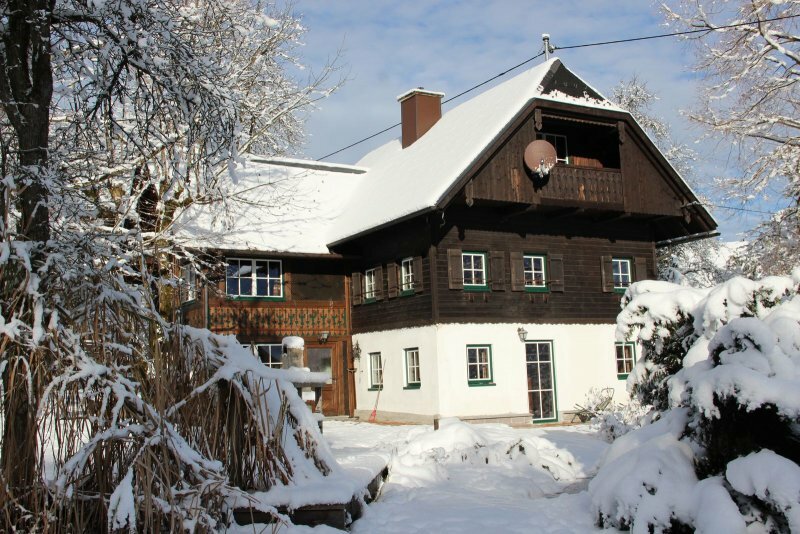 Send booking inquiry for Holiday home "Gut Eisenlehen" now! 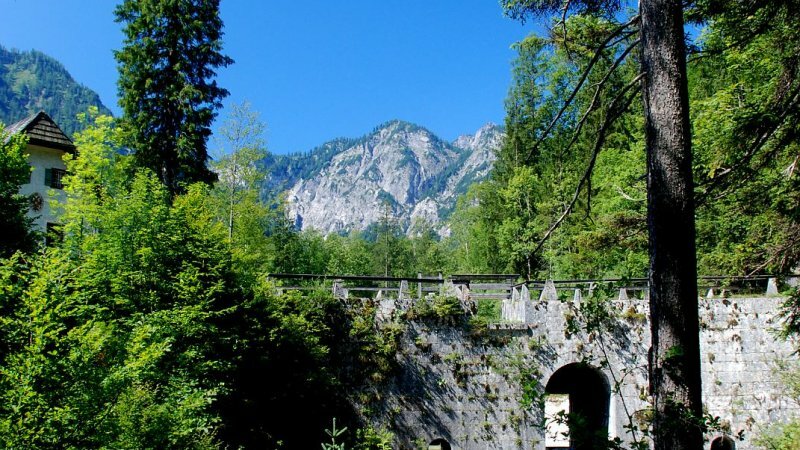 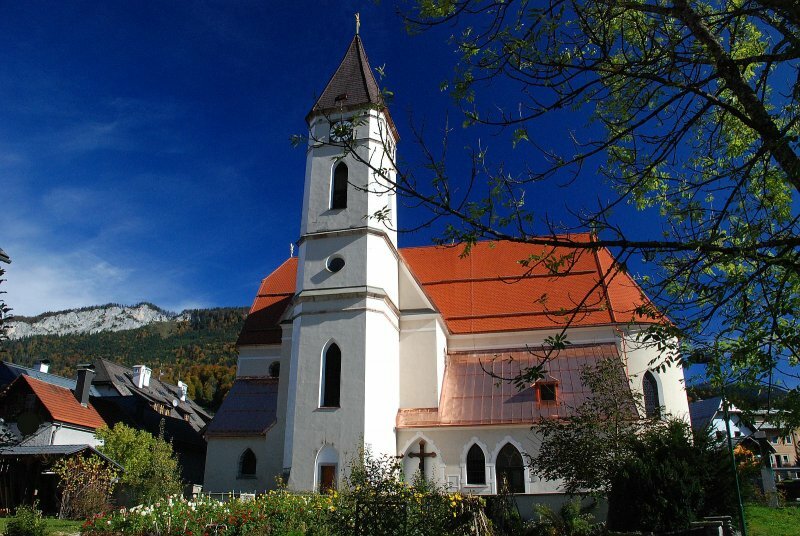 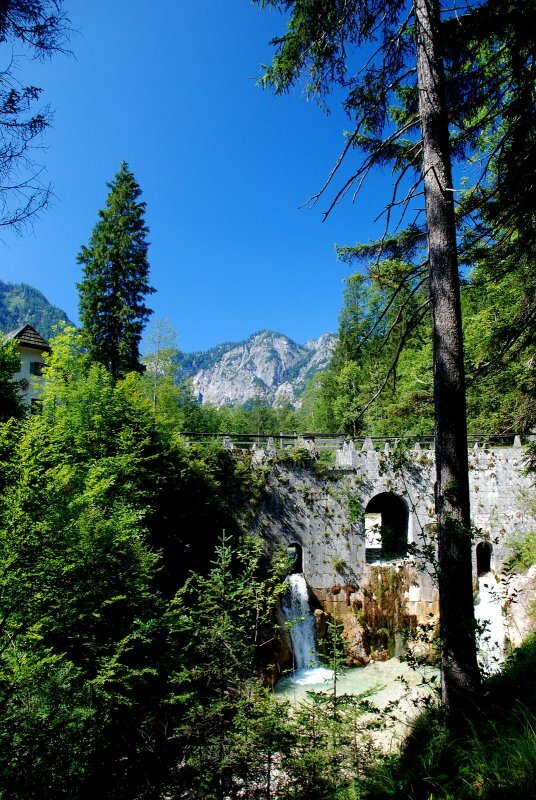 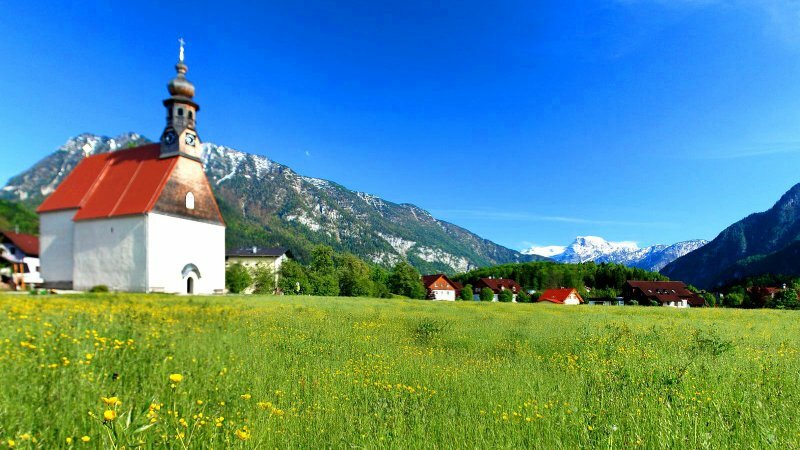 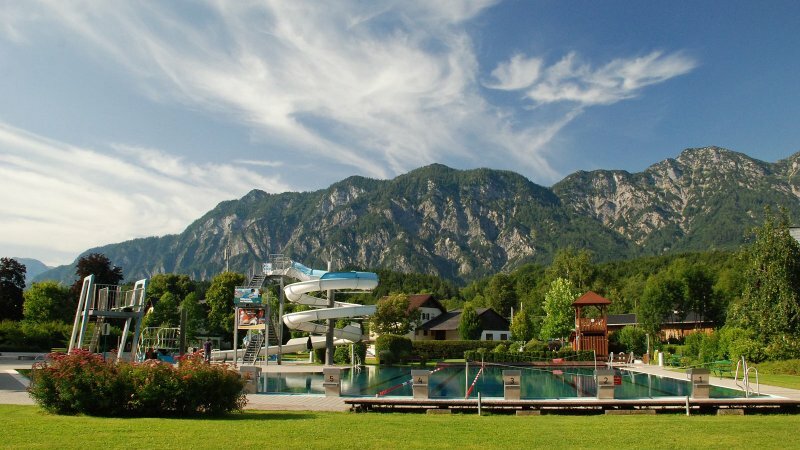 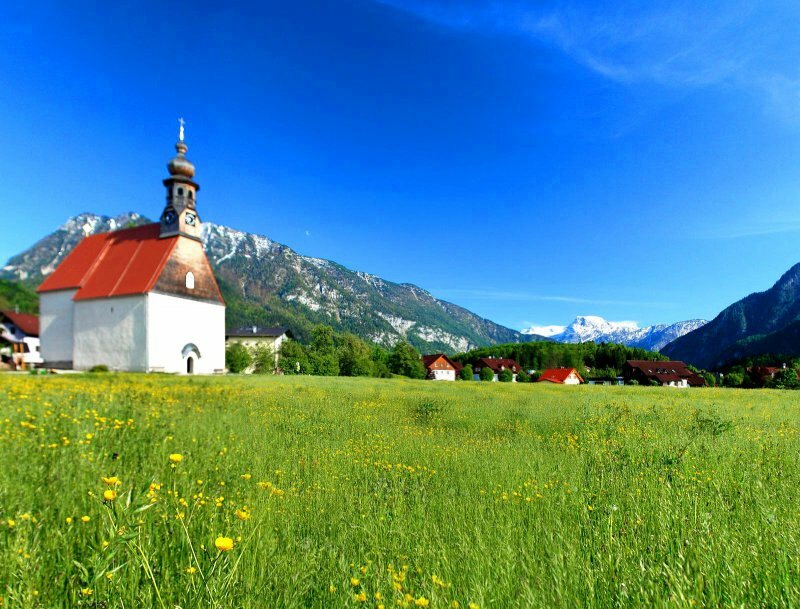 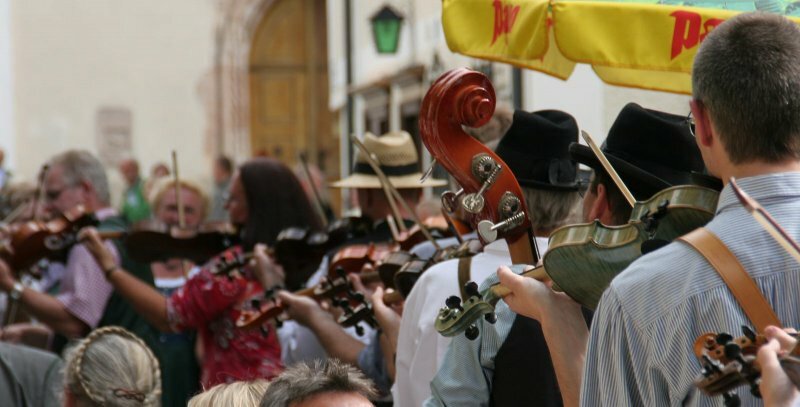 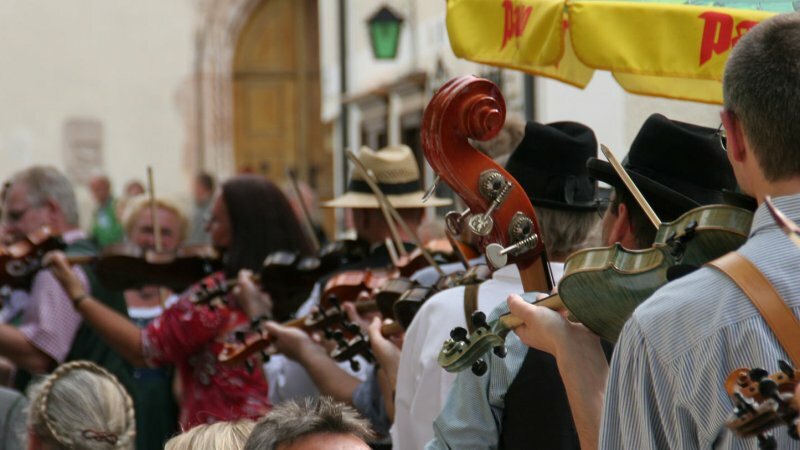 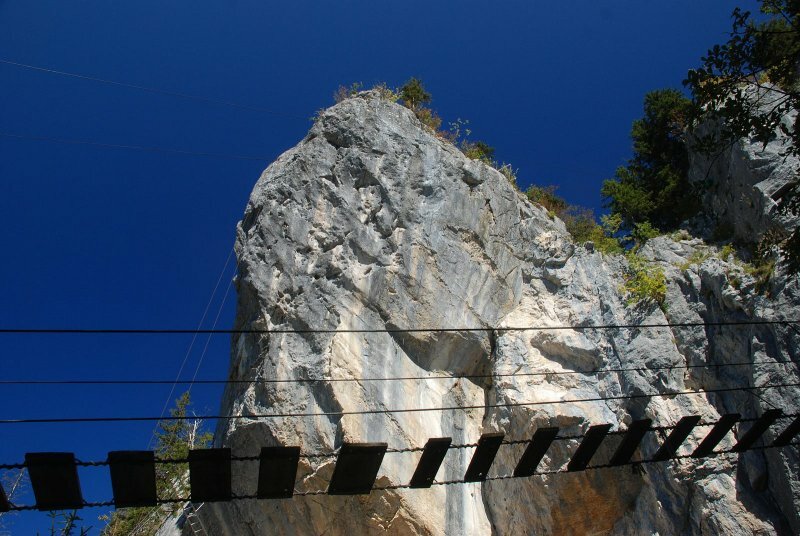 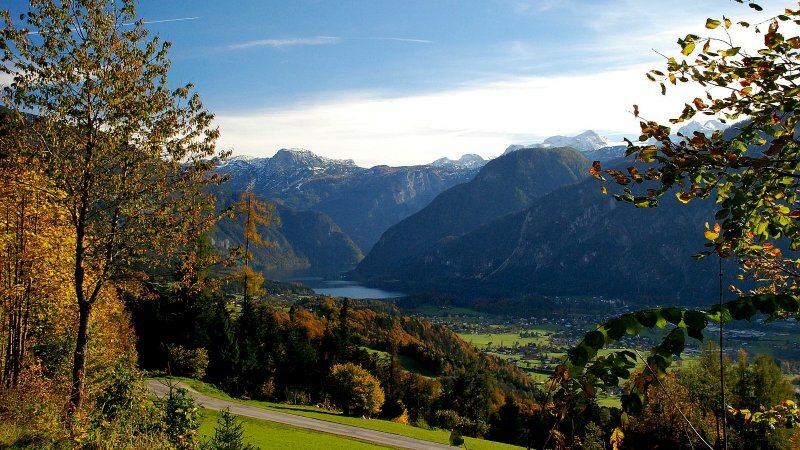 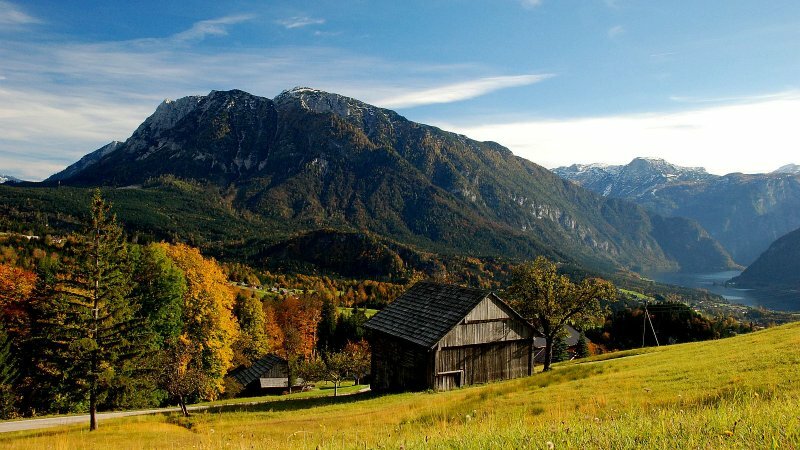 The wide and charismatic valley of Bad Goisern stretches out from Hallstatt in the south to Bad Ischl, the summer holiday resort of the emperor in the north. 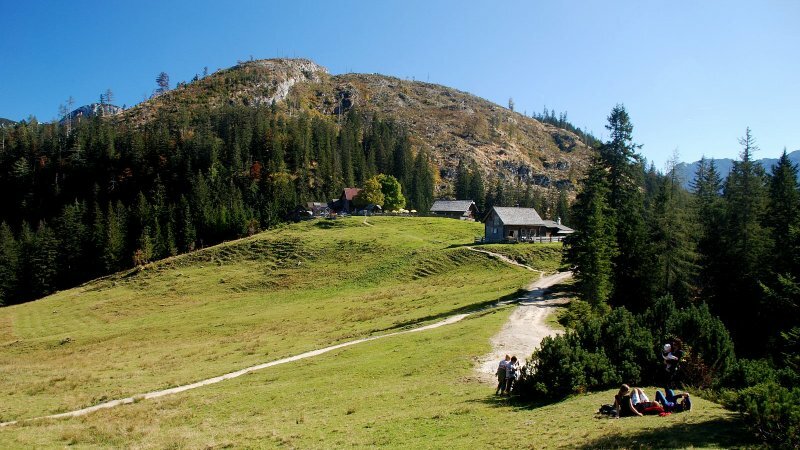 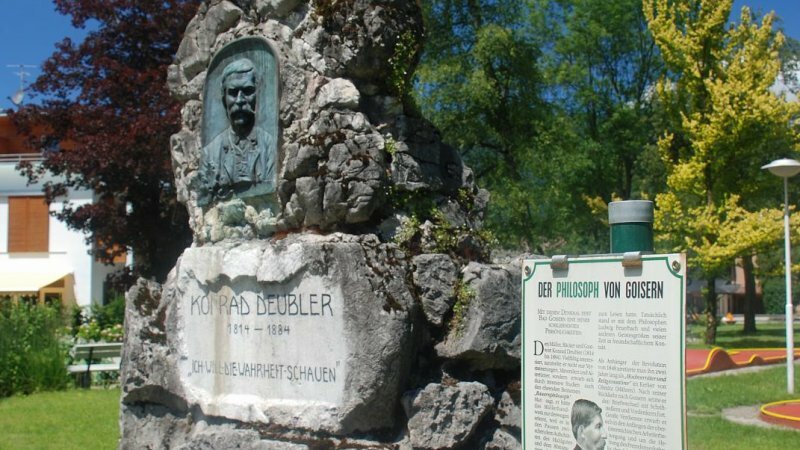 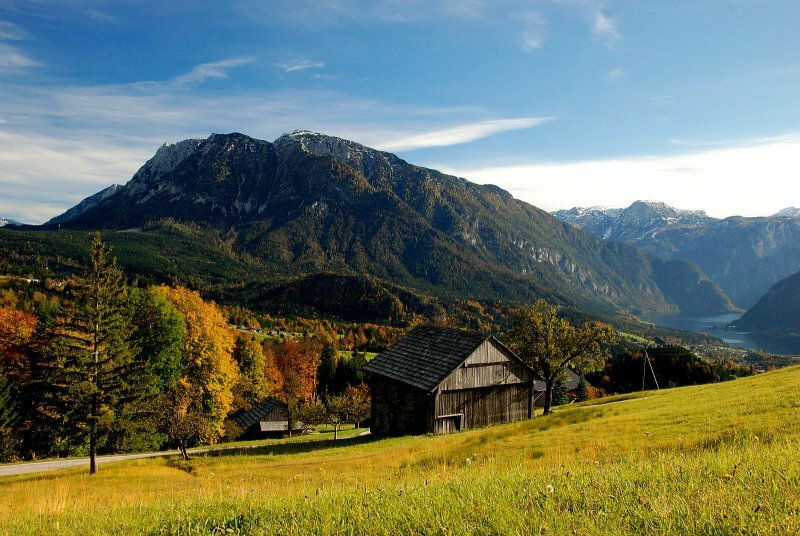 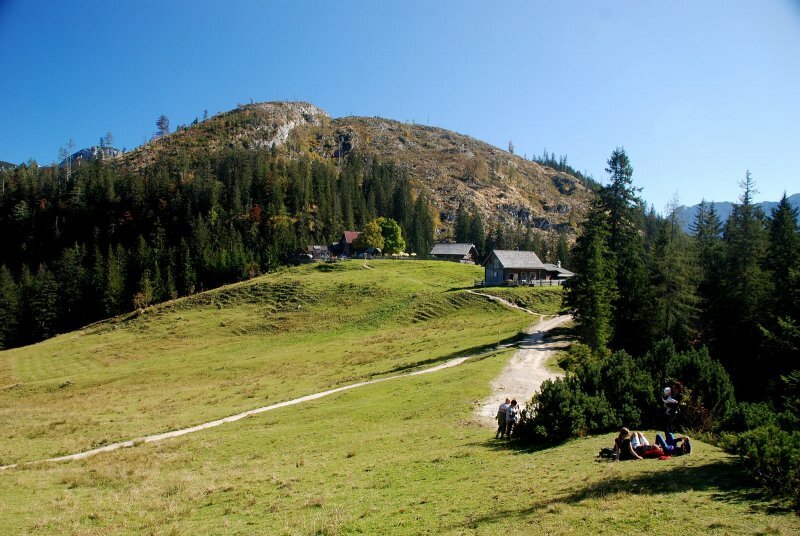 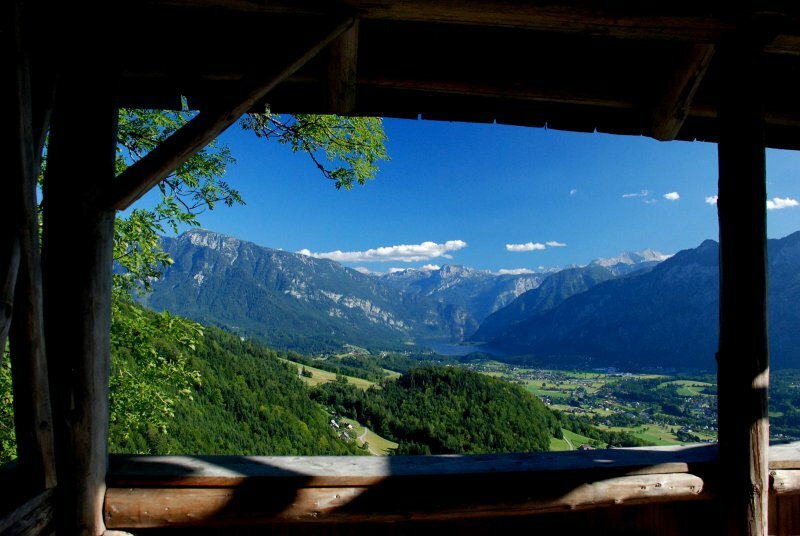 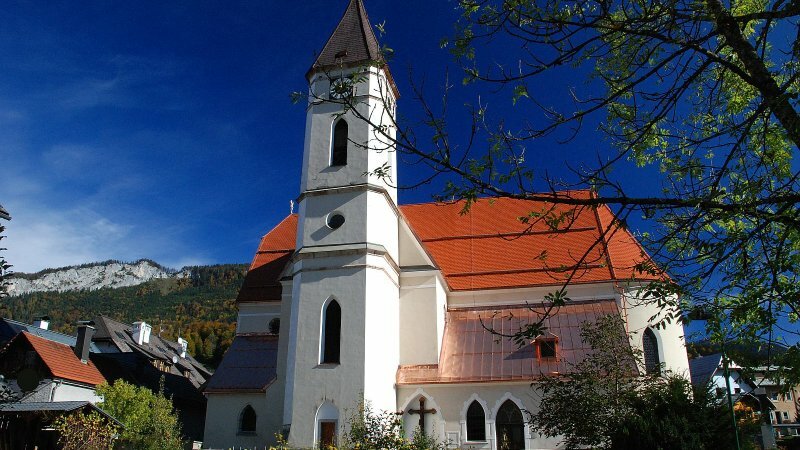 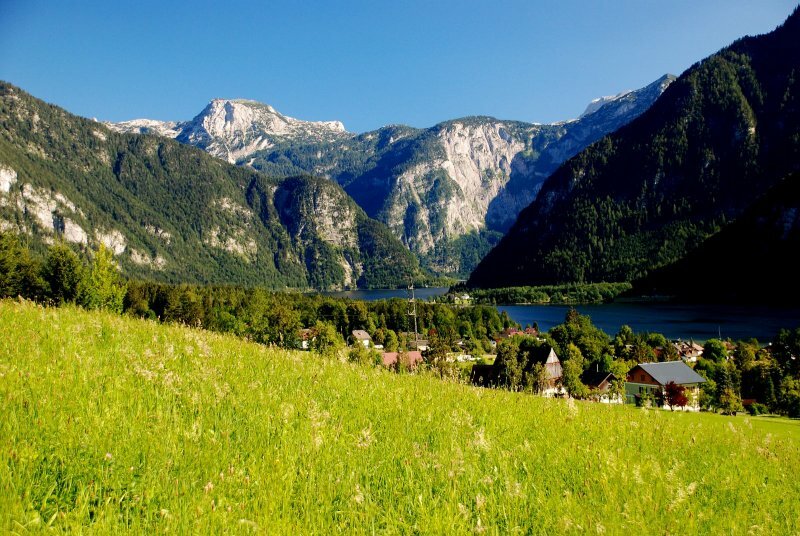 Discoveries dating back to the Stone Age and the Hallstatt period enable us to establish that there was a close contact with villagers from the surrounding regions. 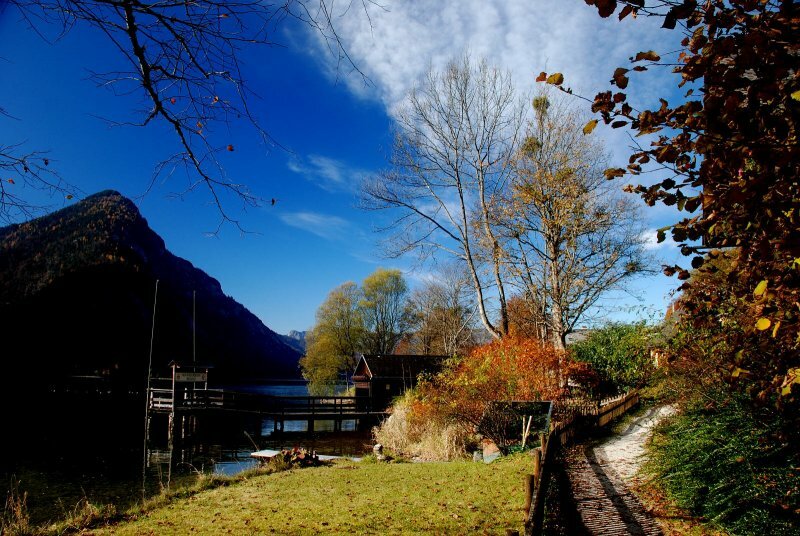 The wood and agriculture industry developed very early in the wide fertile valley of Bad Goisern, to supply the mine in Hallstatt. 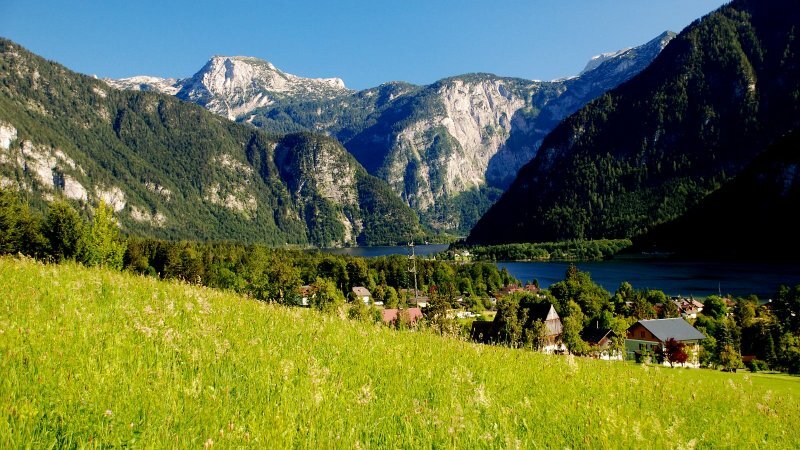 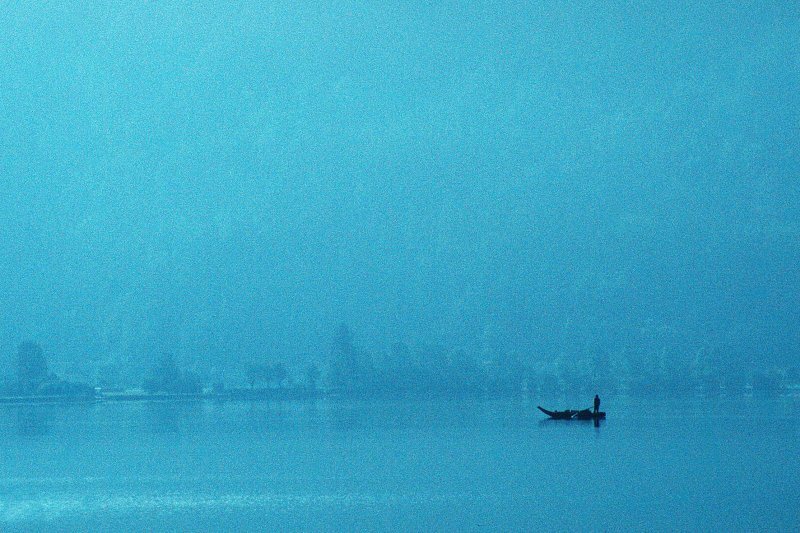 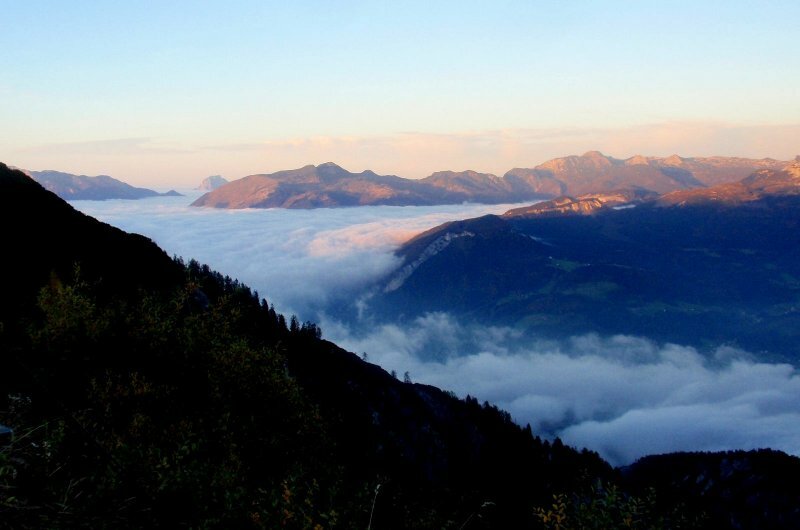 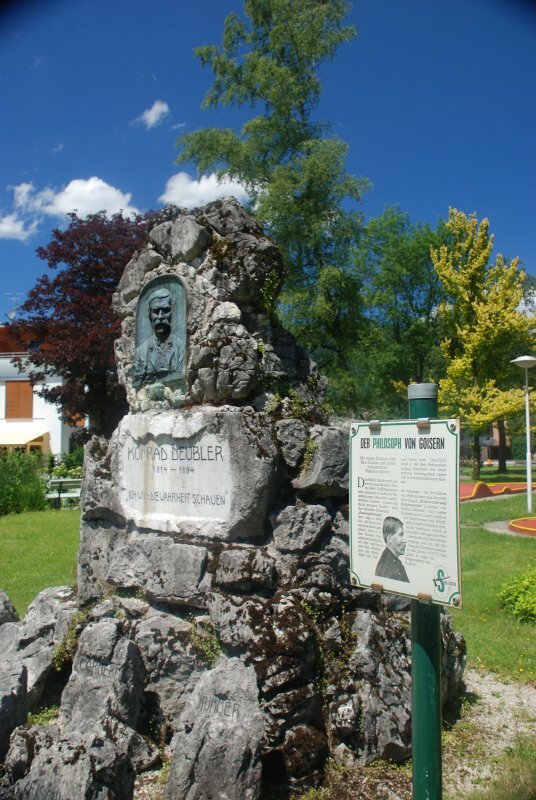 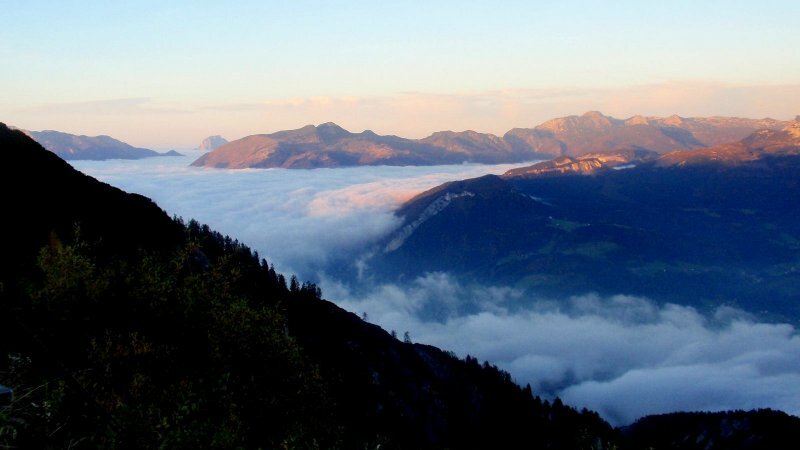 This is how Bad Goisern is where it is now, on prettiest landscapes of the Salzkammergut. 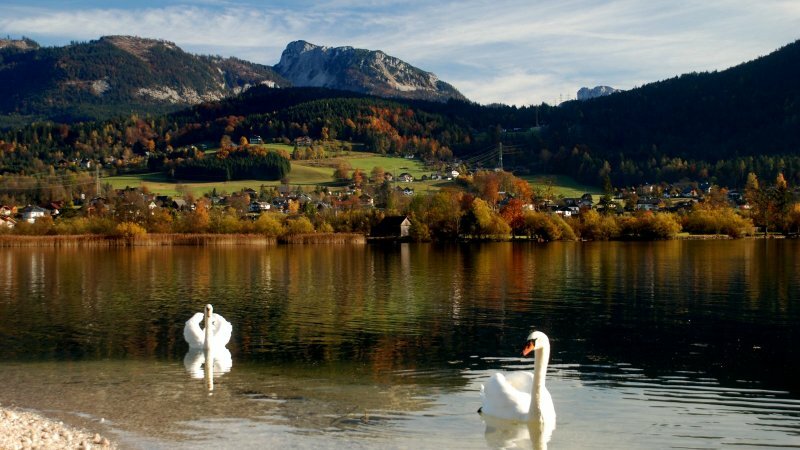 This enchanting village used to be called “The Monarchies most beautiful village“ and still hasn’t lost any of its charm.